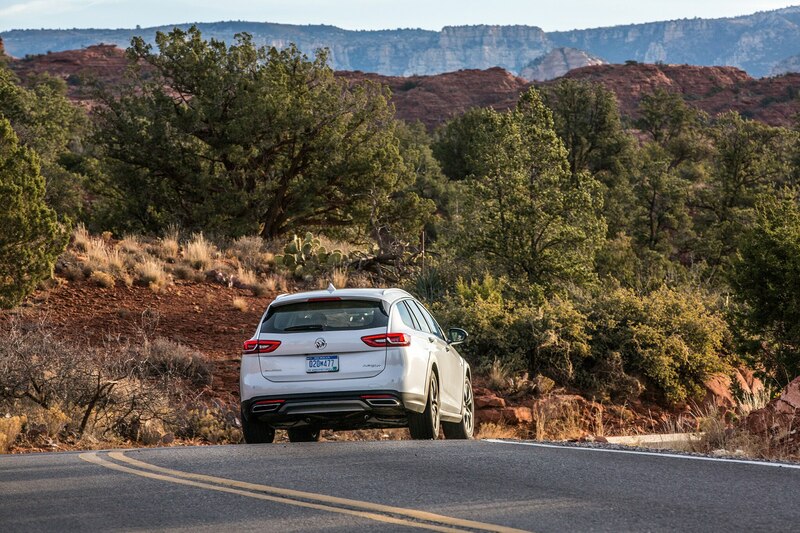 SEDONA, Arizona — Where are the golf bags? 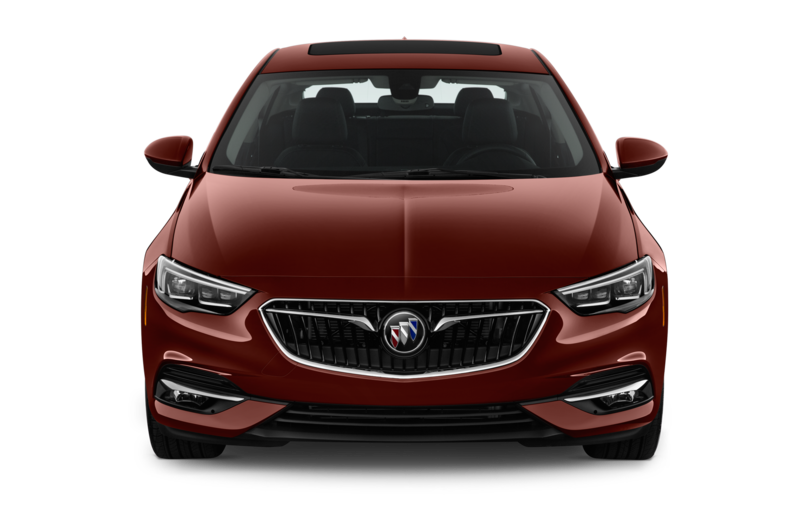 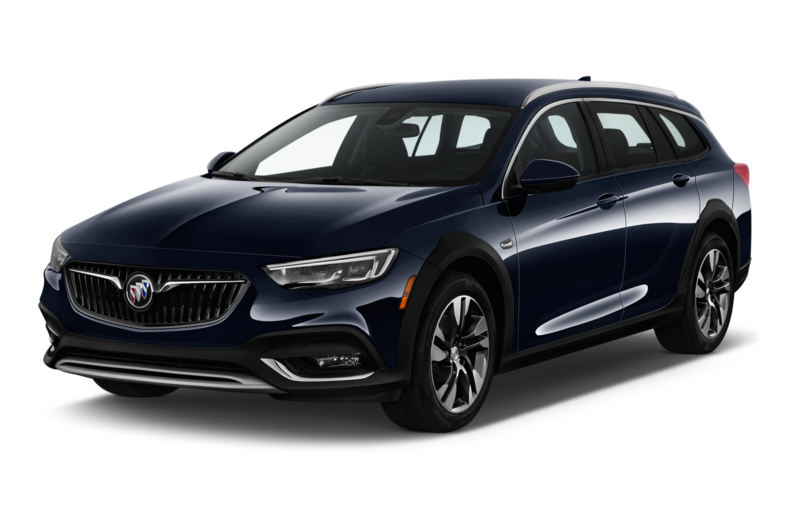 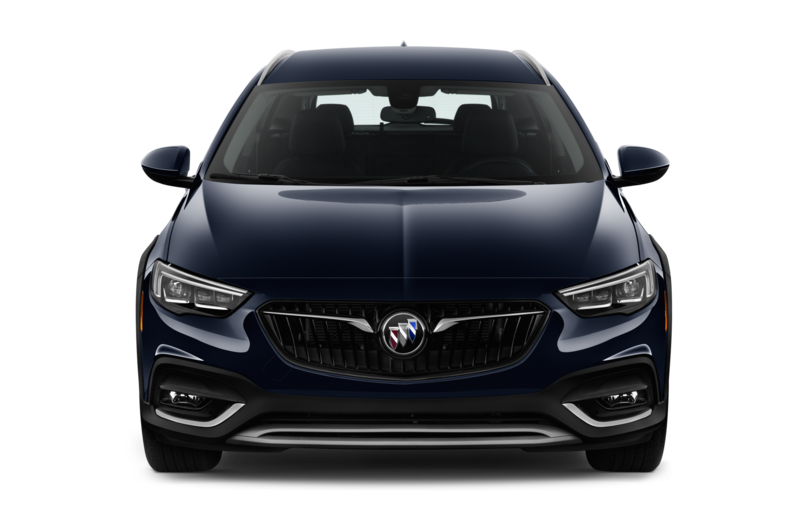 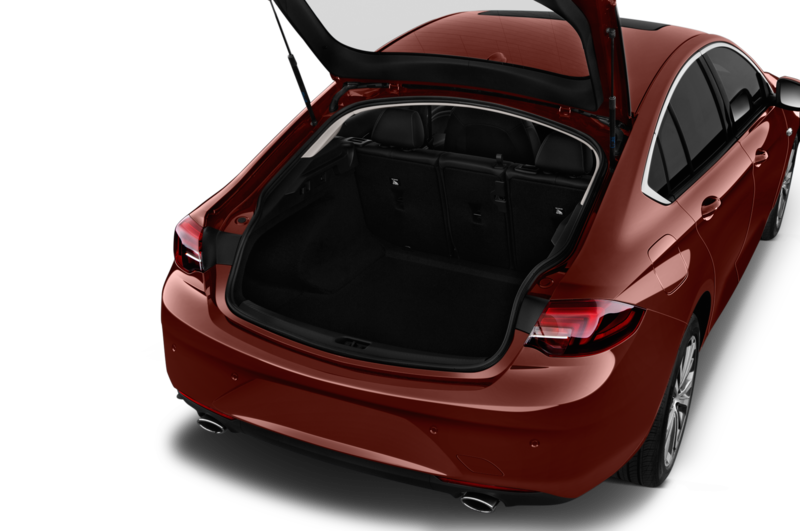 Buick has let its connection to the game of golf age-out and didn’t bother to tell us how many bags you can fit in the 73.5 cubic-foot cargo space of this, er, crossover/utility something-or-other. 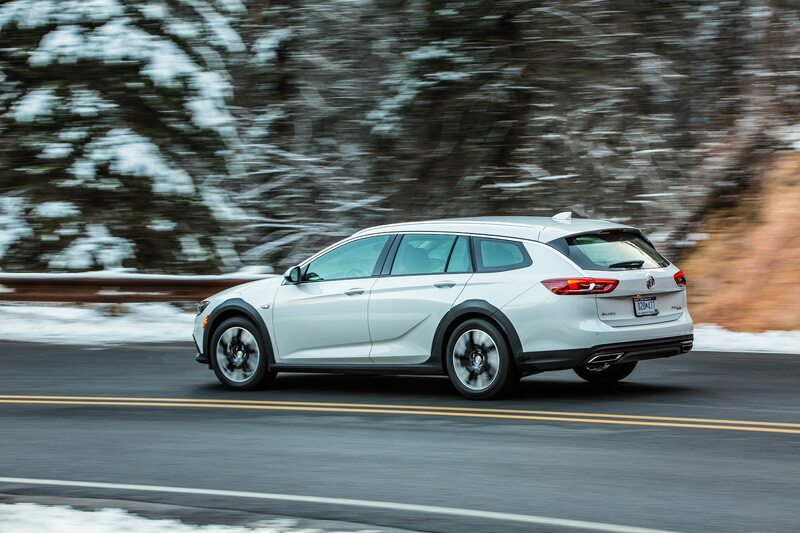 The 2018 Buick Regal TourX is not a station wagon (that term has also aged out), or so its maker claims, though fellow auto journalists who love that long-forsaken bodystyle are quick to give it such a description. 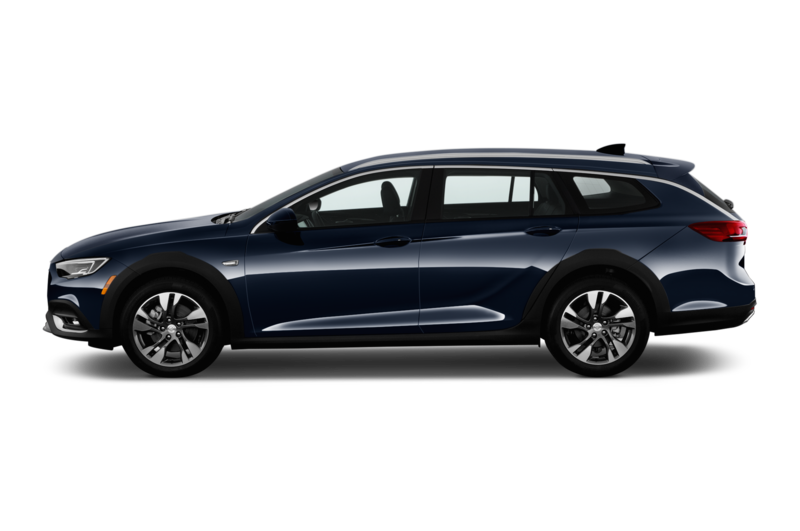 Call it whatever you call the Subaru Outback, Audi Allroad, or Volvo V90 CC, because this is the new model for those who want something a bit nicer and more upscale than the former and can’t afford the latter two. 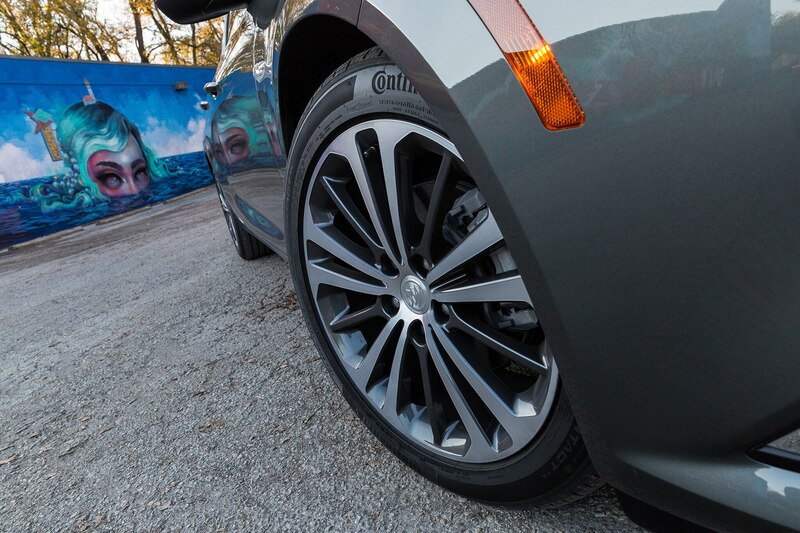 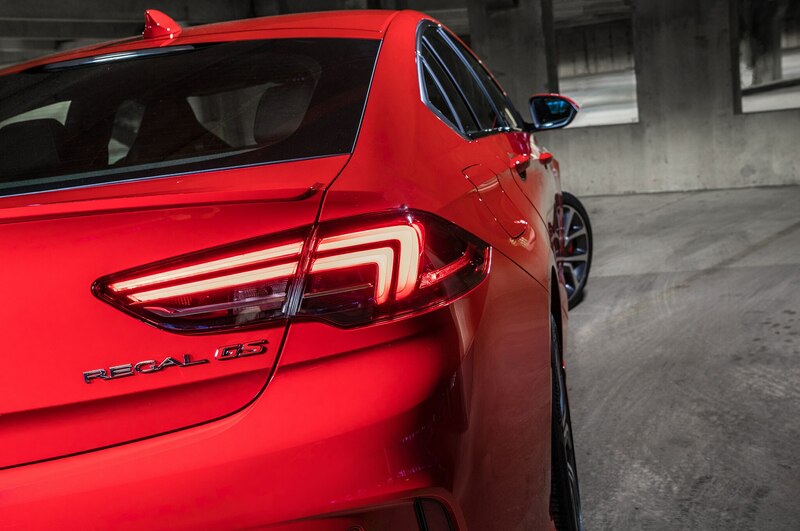 For that reason alone, it earns our respect as a Not Boring Car. 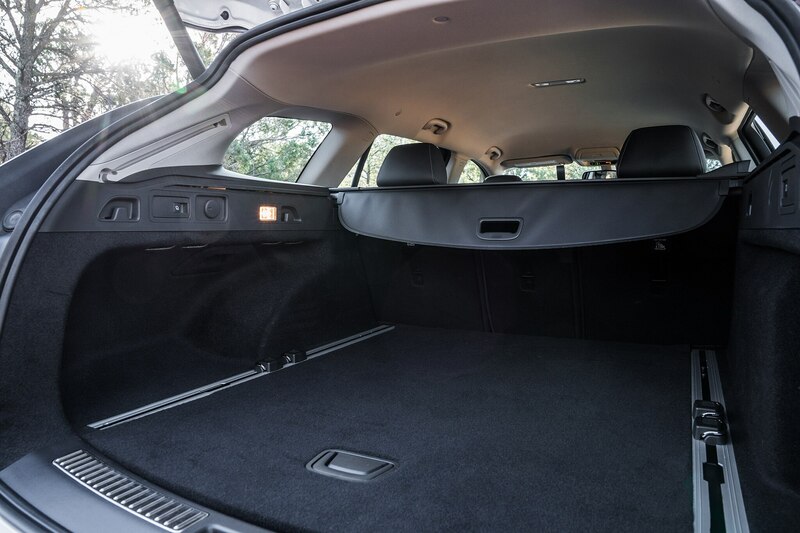 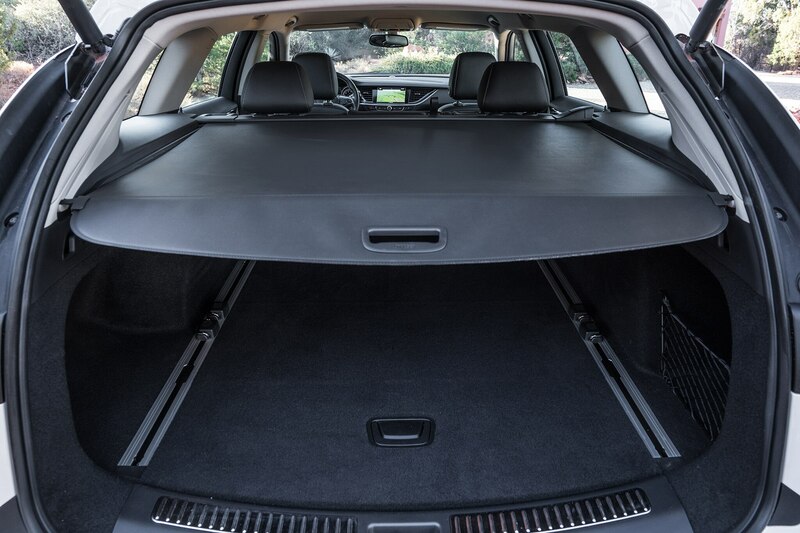 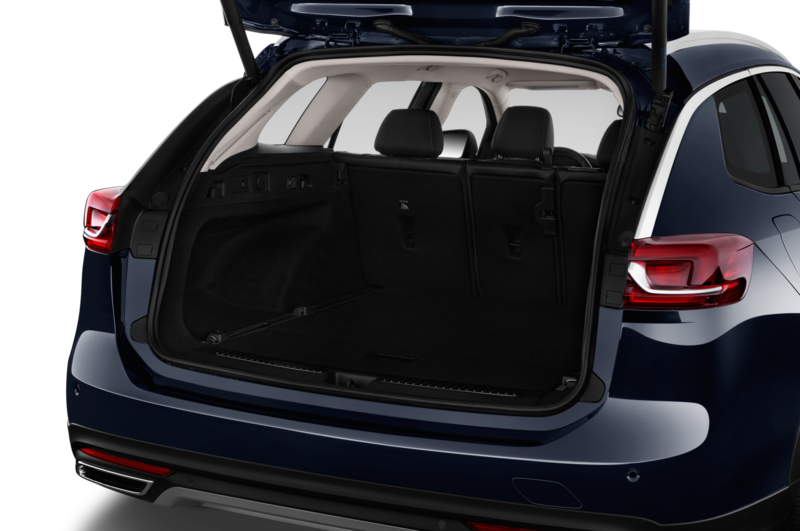 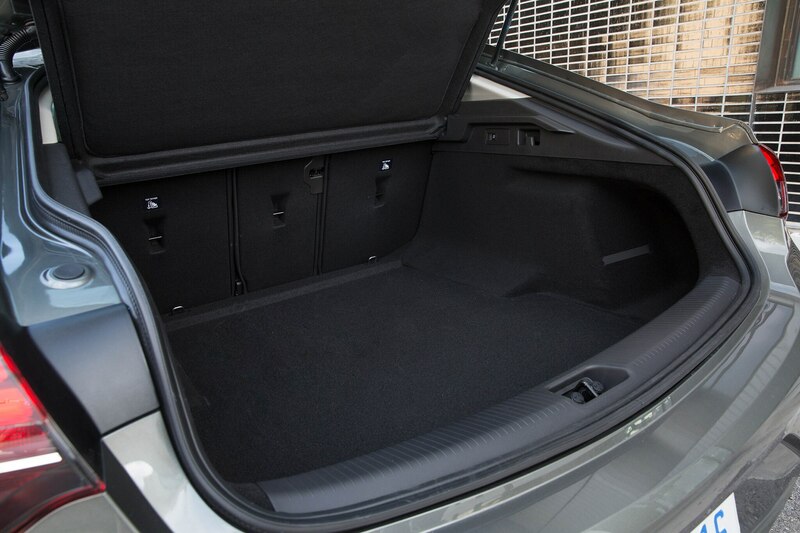 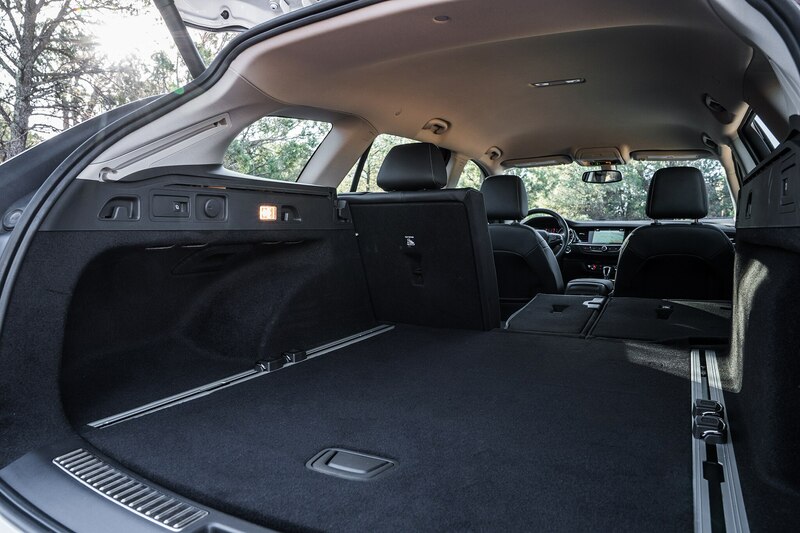 Its cargo capacity of 73.5 cubic feet with the rear seat folded tops the Lincoln MKX, Acura RDX, Audi Allroad, and Volvo V60 CC, though it’s capacious more because of the load floor’s length than its width, which is hampered by more intrusive than usual wheel wells and a fairly narrow liftgate aperture. 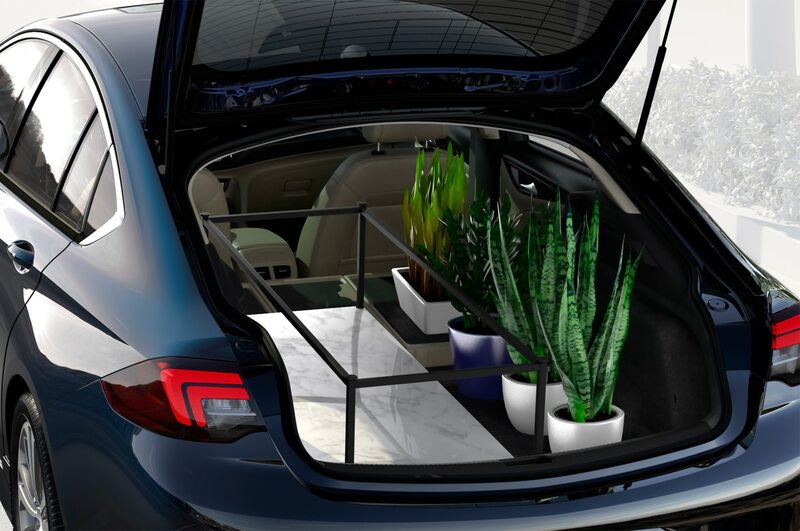 So it might not be quite as useful when it comes to carrying wide items. 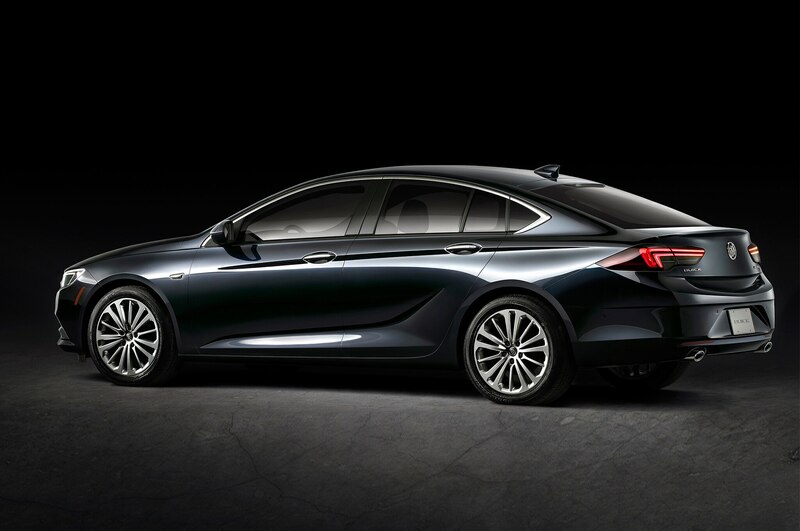 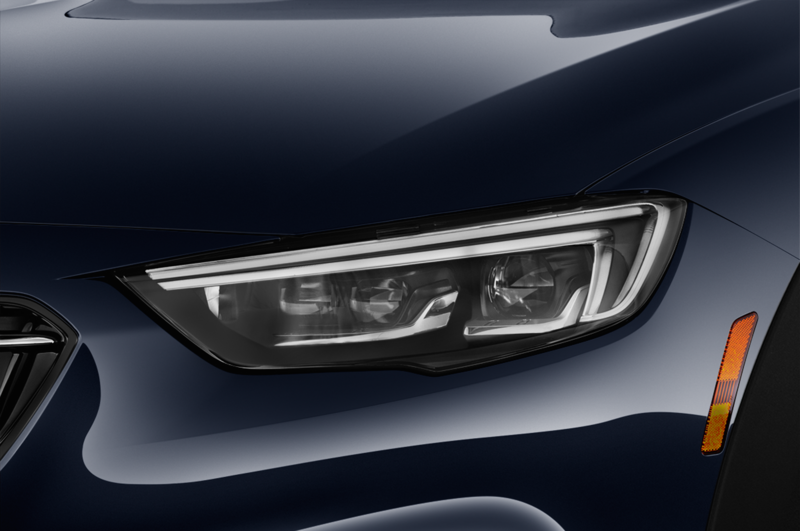 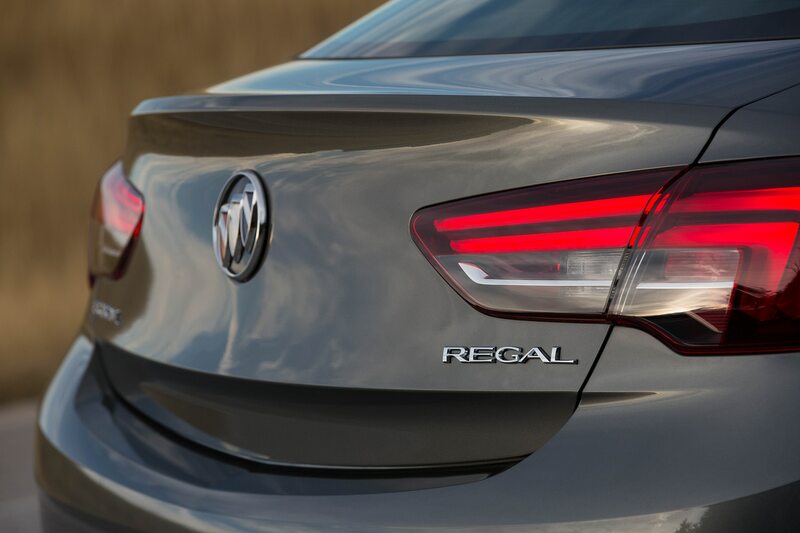 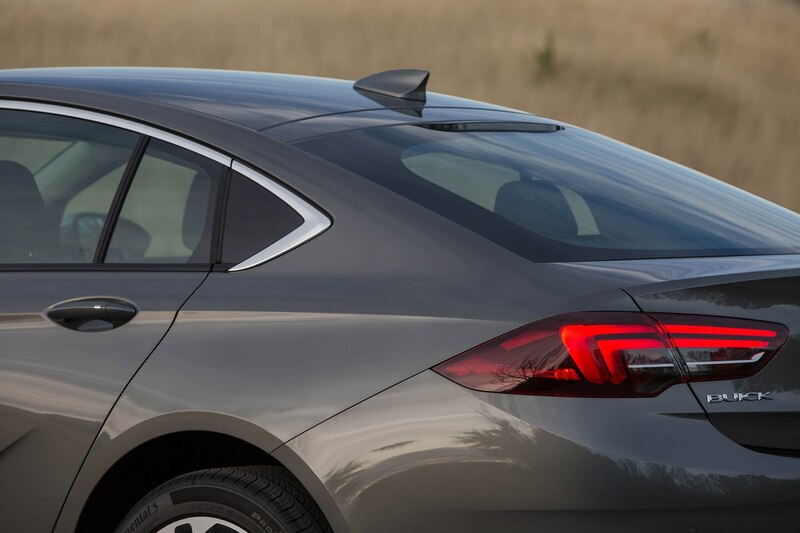 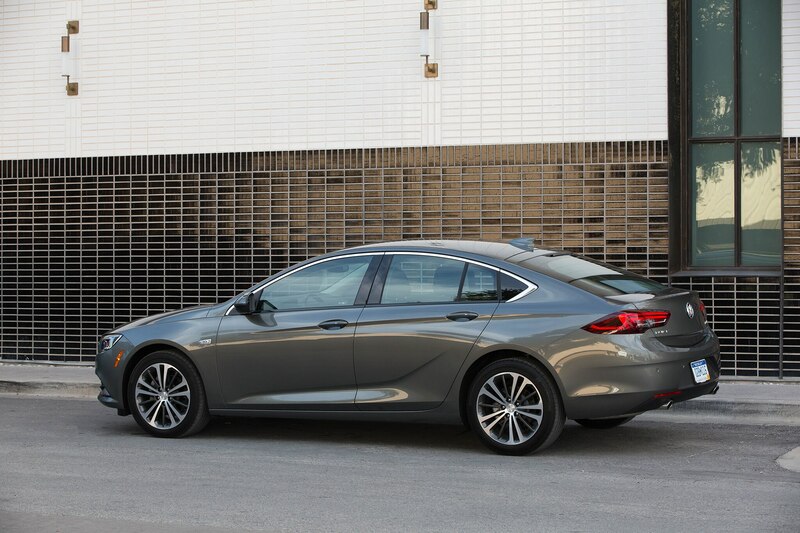 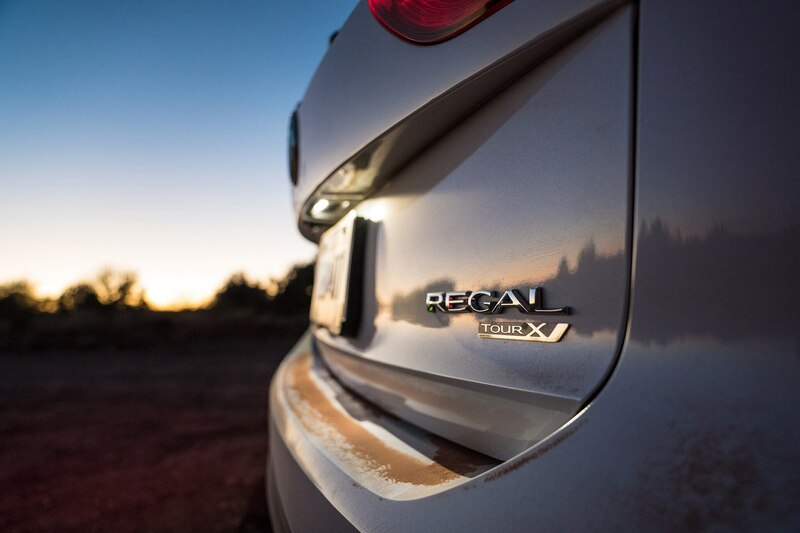 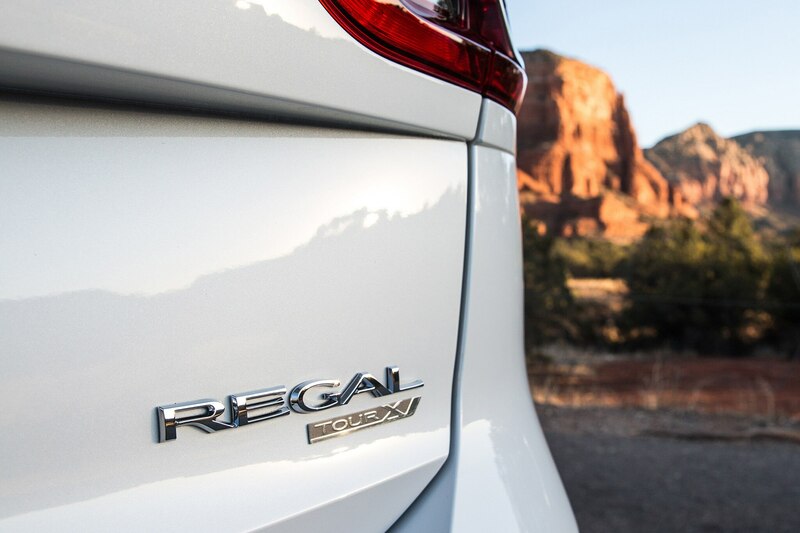 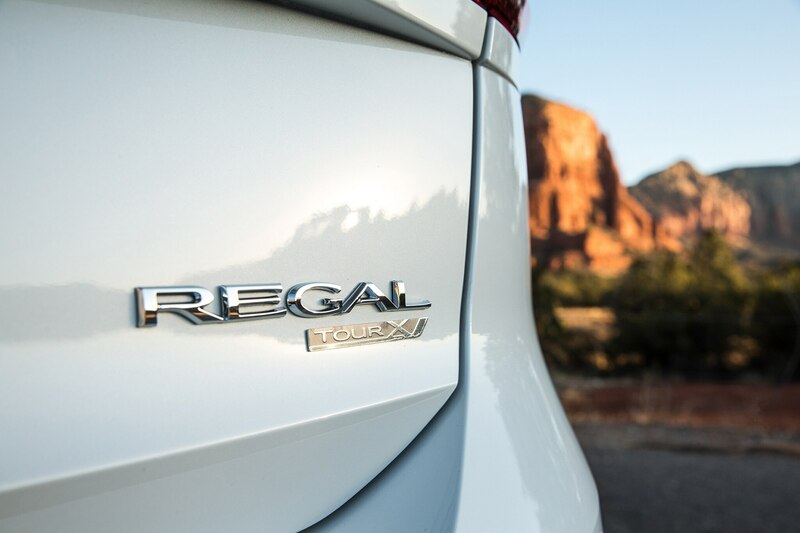 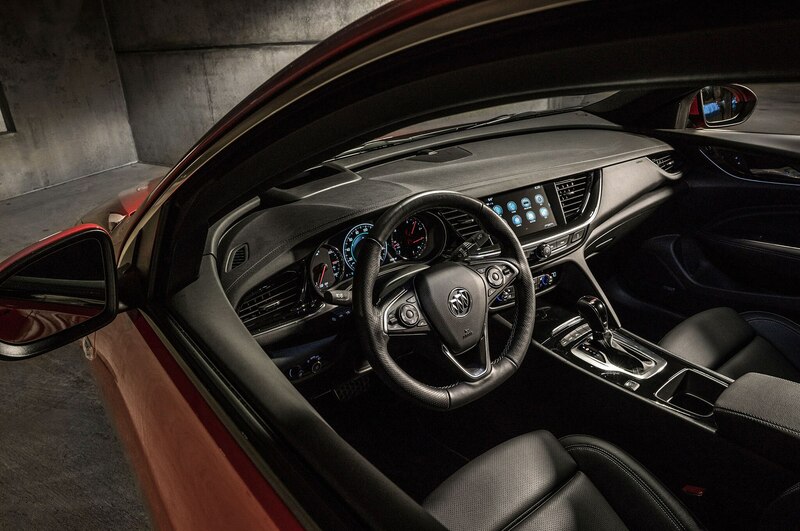 Perhaps this is due to limitations of the new Regal’s design—like the outgoing model, it was first an Opel Insignia. 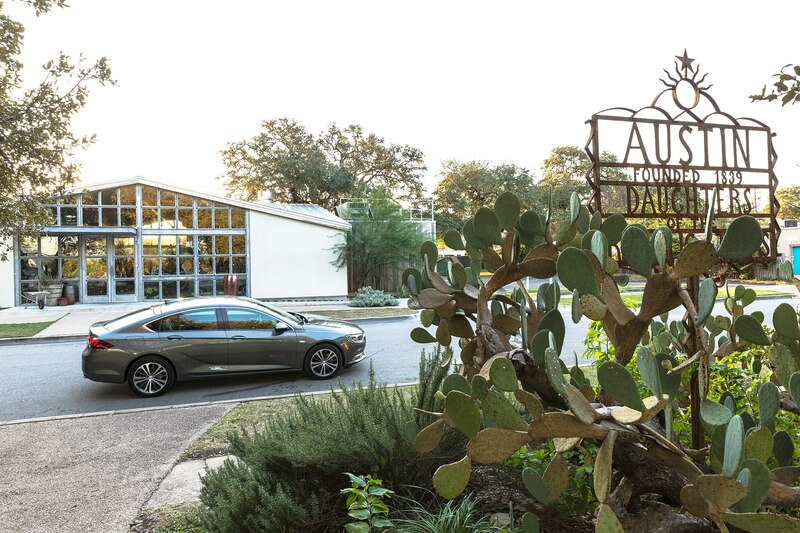 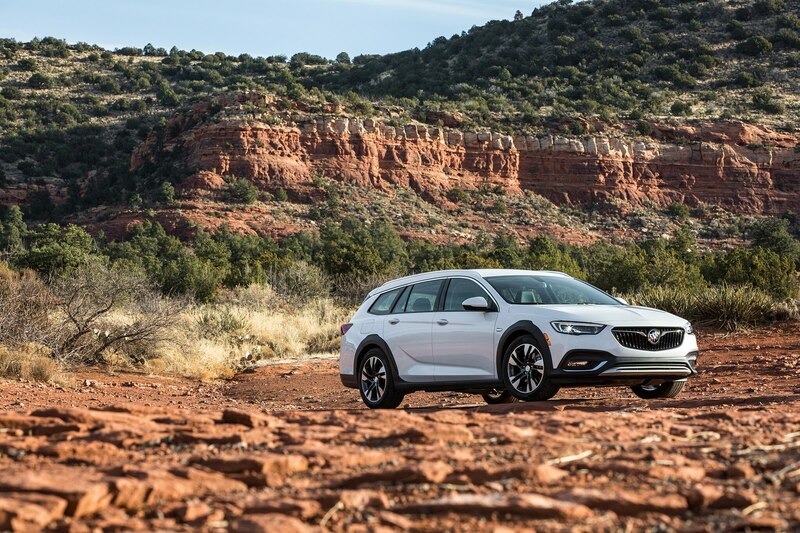 The advantage is the Regal TourX’s height of just 58.4 inches is about the same as that of a 1968 Buick Sportwagon (the model with the “vista roof” windows), but with those black plastic overfenders that give it an Outback/Allroad look. 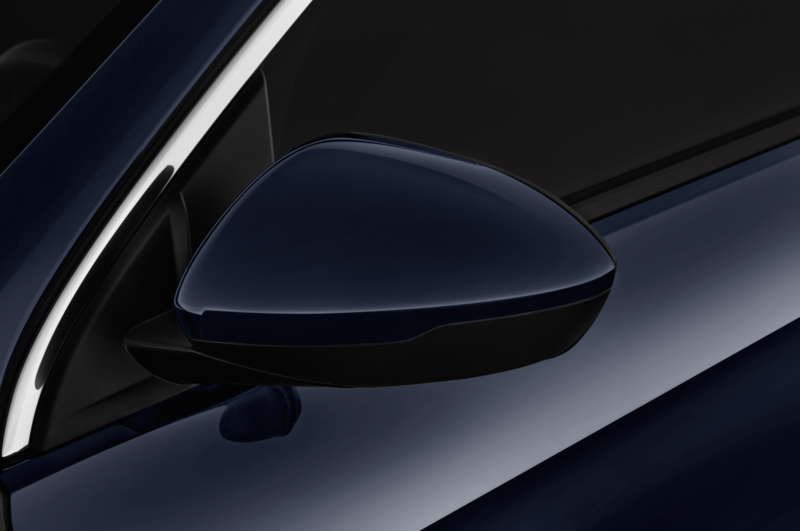 Its optional panoramic sunroof ($1,200) serves as a sort of modern interpretation of the vista roof. 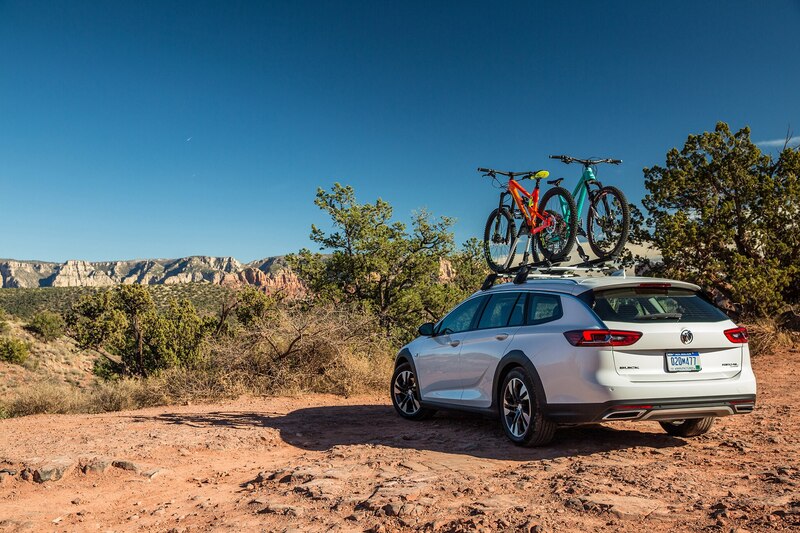 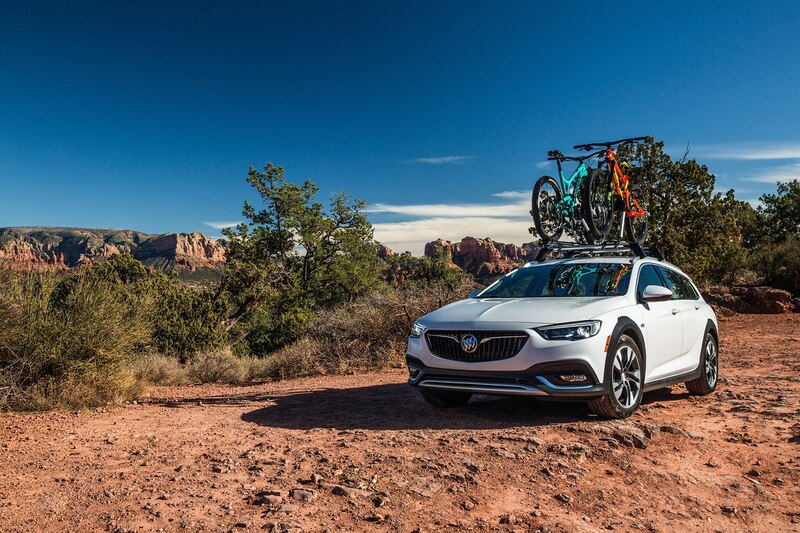 More relevant as a comparison, the TourX is a full 11.5 inches lower than the new Enclave, and Buick demonstrated that TourX height advantage by having us attach mountain bikes to its roof. 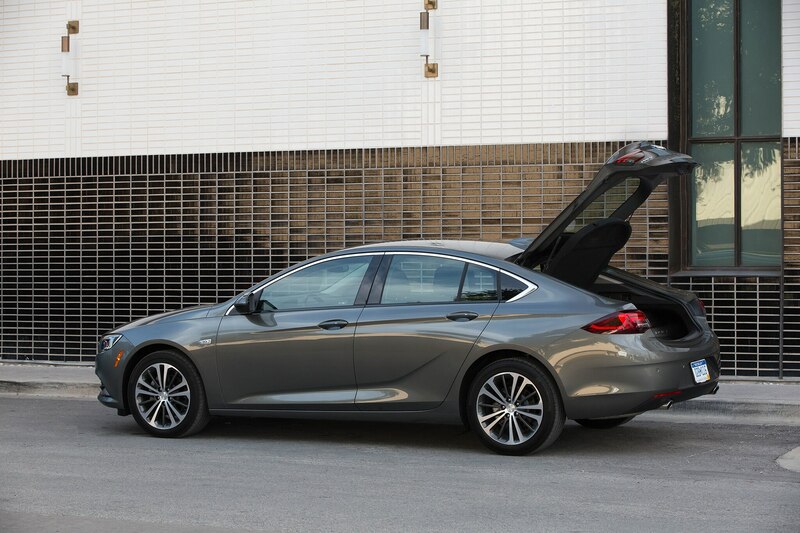 It was pretty easy, requiring no ladder. 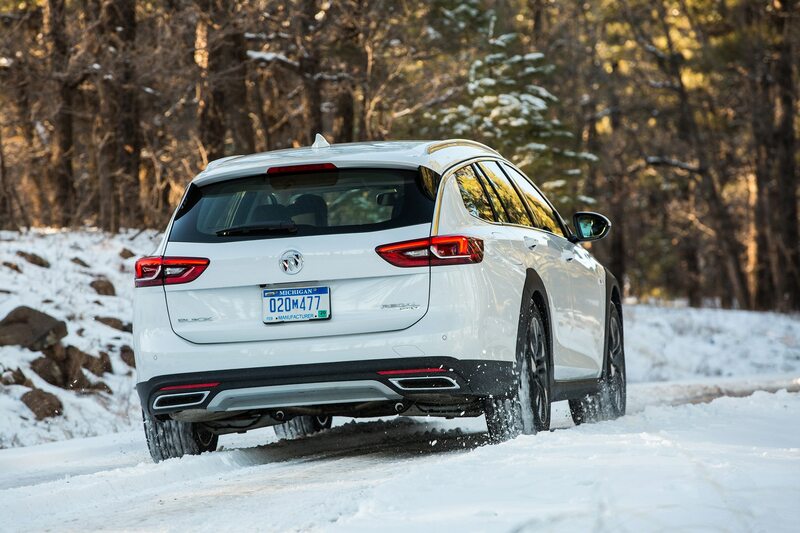 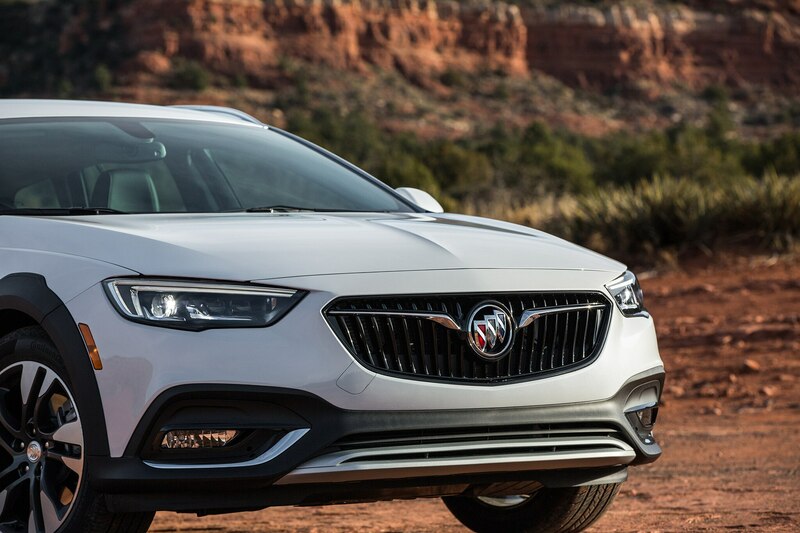 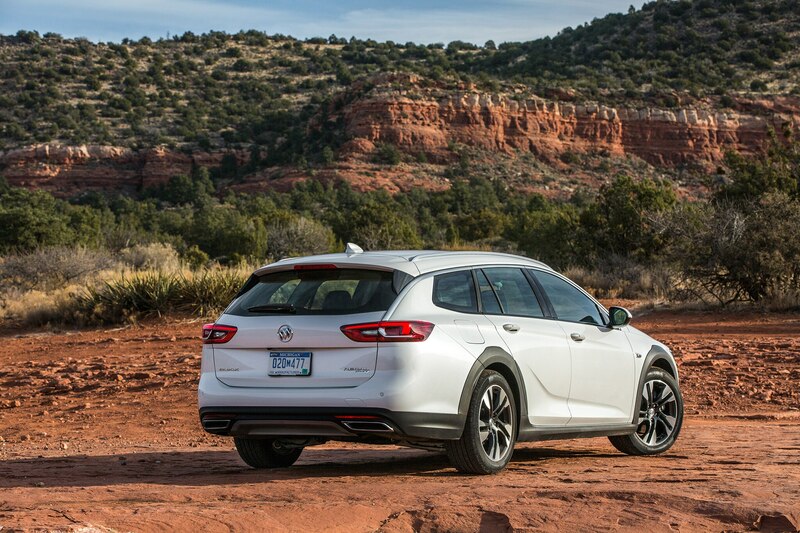 From this married-with-no-kids auto hack’s perspective, there’s more sport-utility in this Buick crossover than in most sport/utilities, so long as the off-roading is limited to snowy or dirt roads. 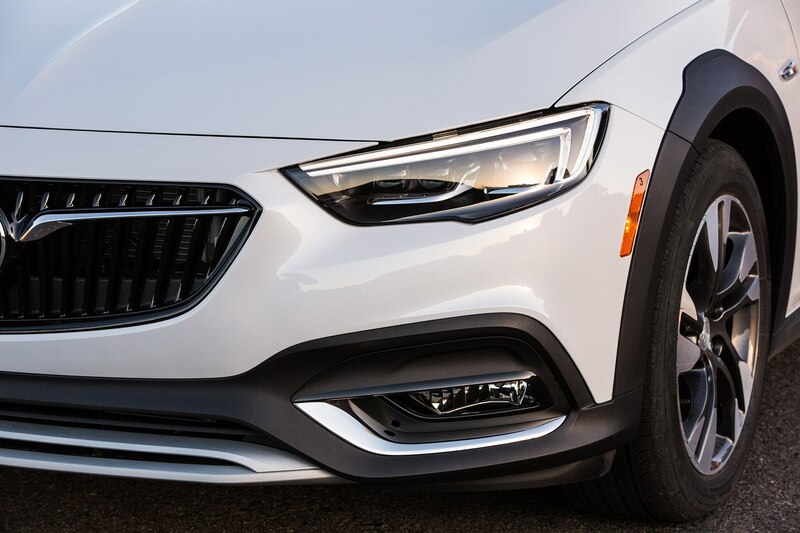 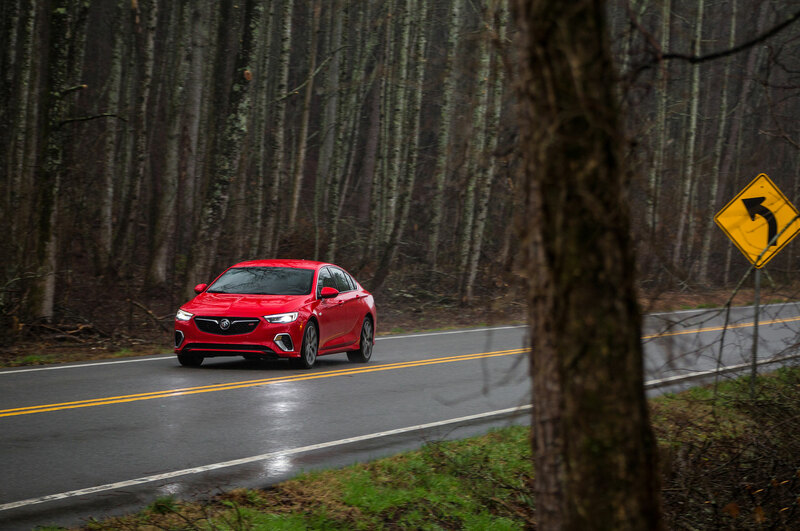 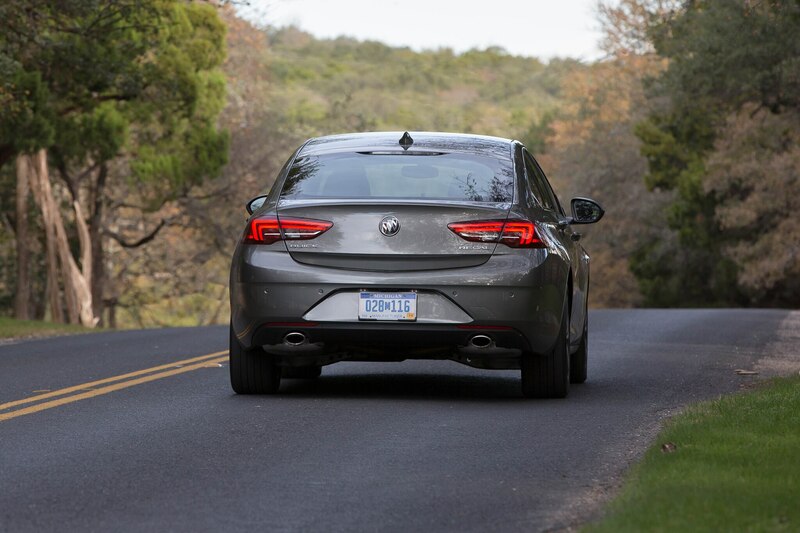 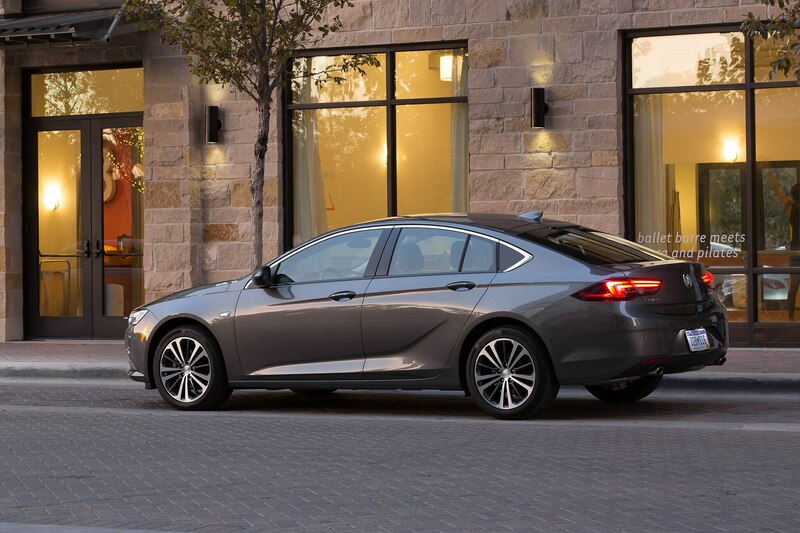 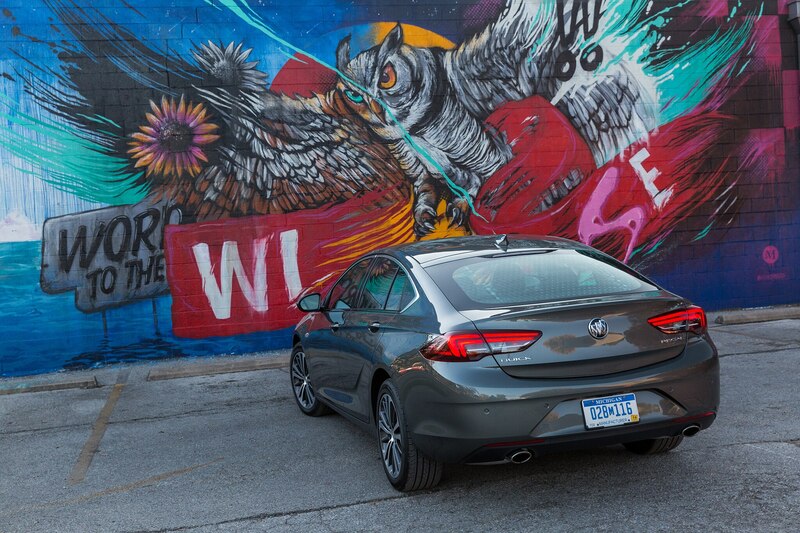 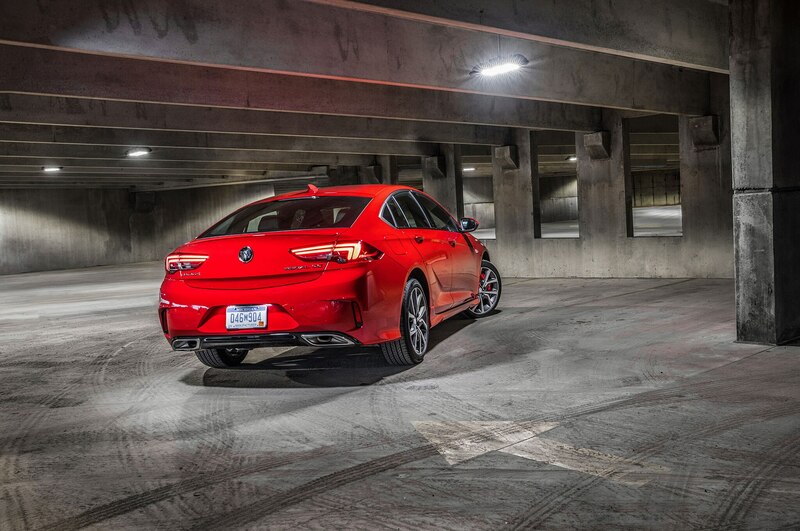 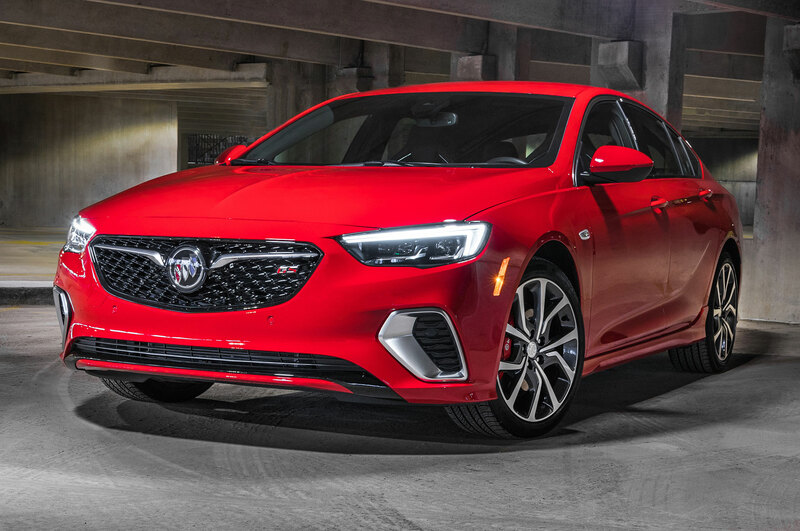 The TourX has roughly ¾-inch more ground clearance than the Regal Sportback, half of which is “ride-height tuning,” better known as taller springs, and the other half is are 235/50R18s in place of the hatchback’s 245/45R18s. 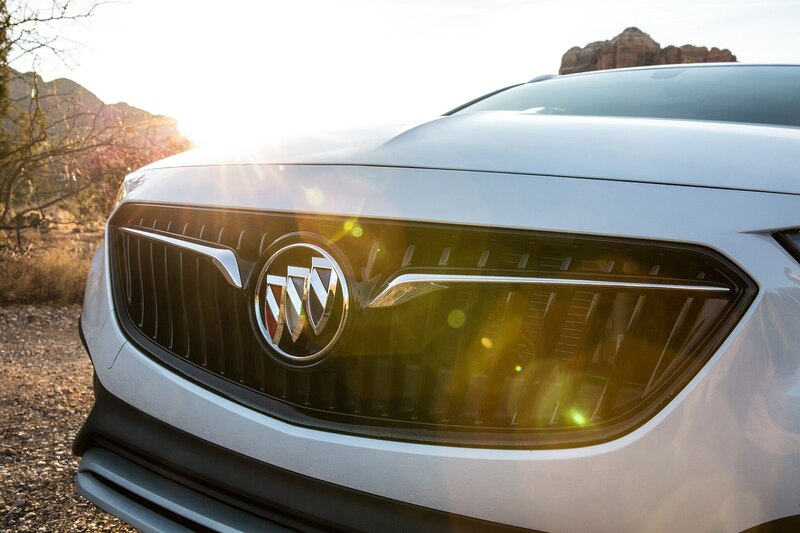 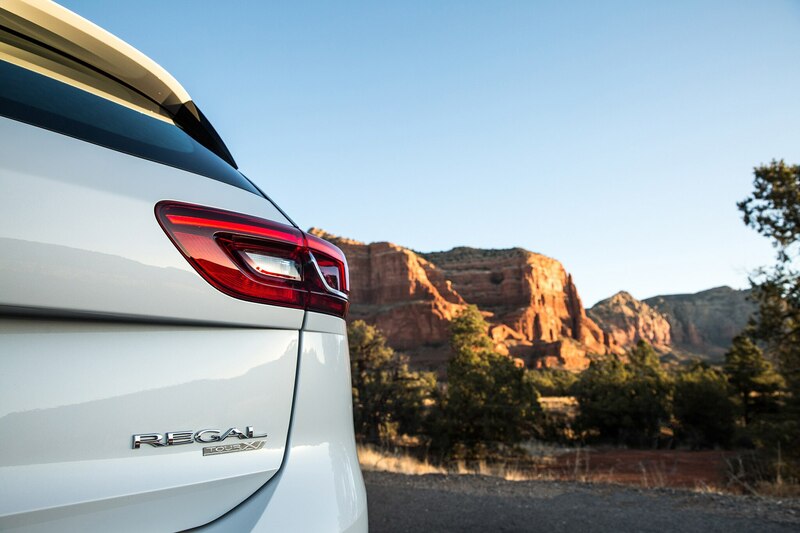 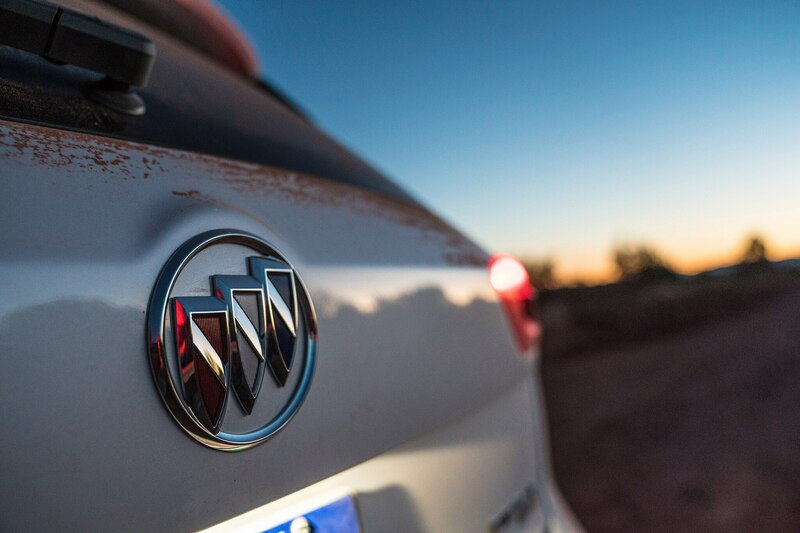 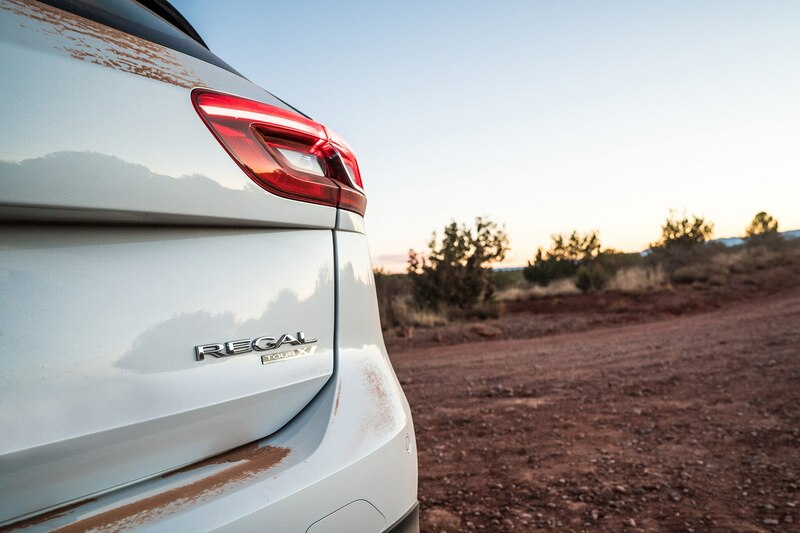 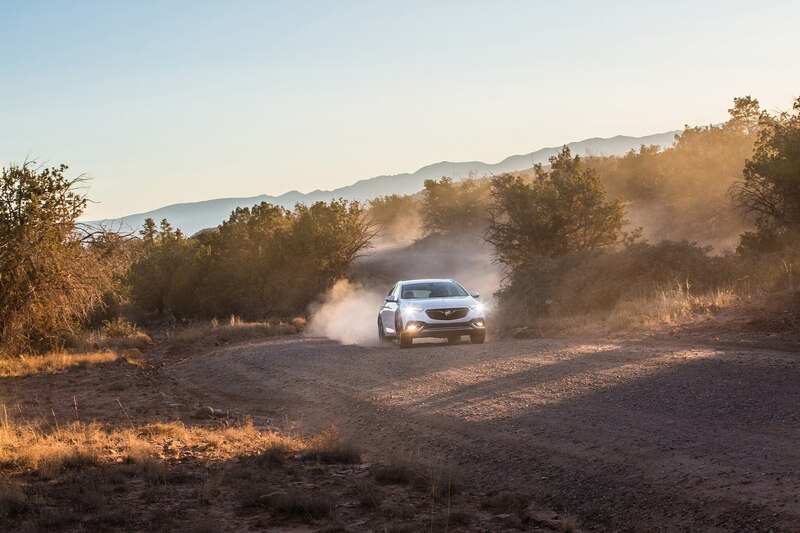 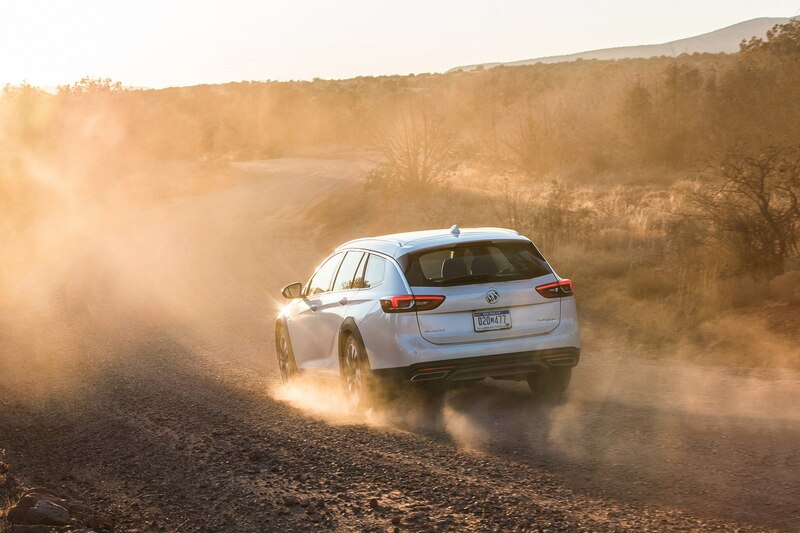 Buick demonstrated this with a total of 10 miles on red dirt-and-gravel roads near Sedona, though of course we didn’t dare try anything more rugged. 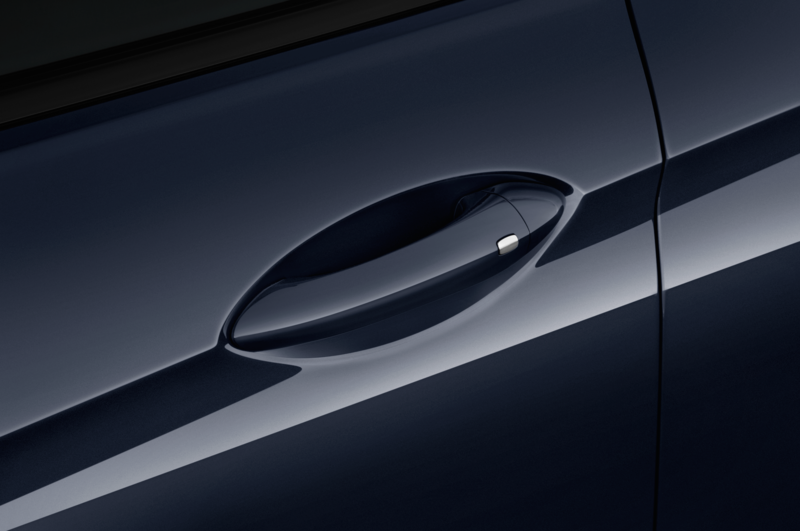 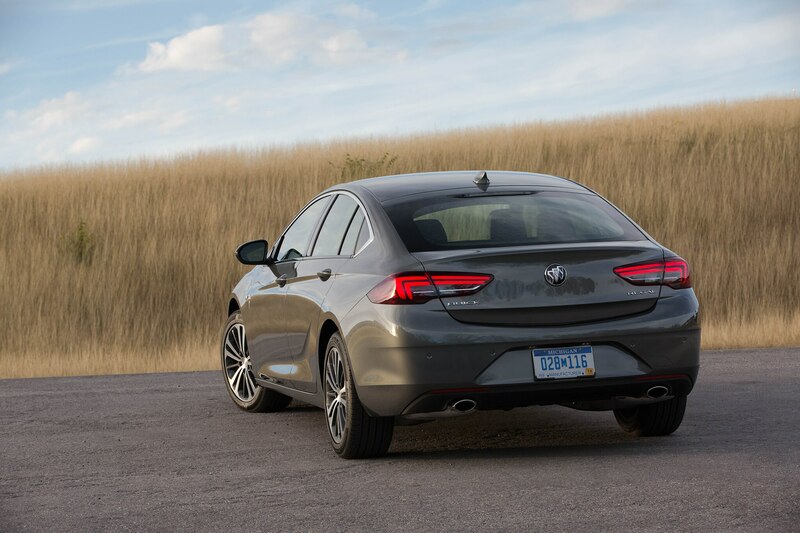 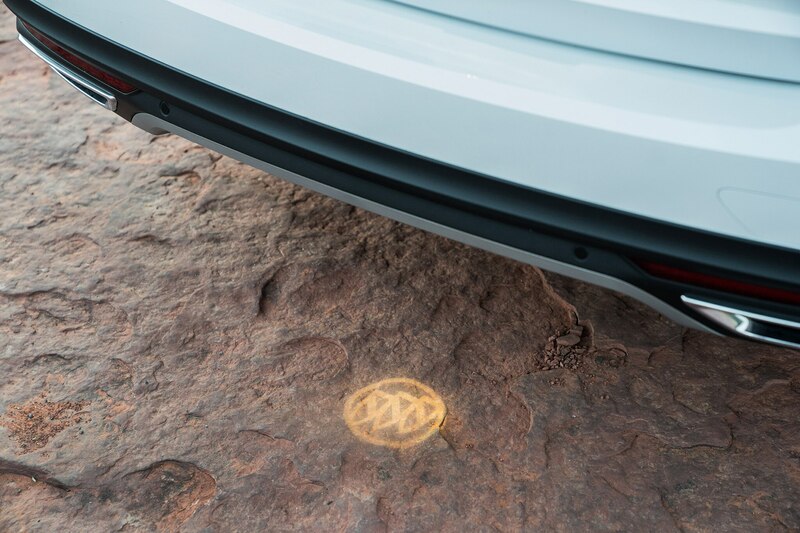 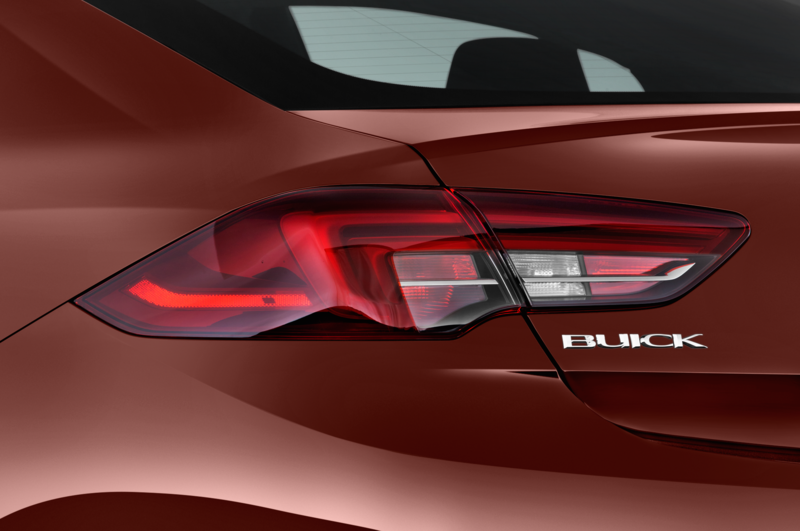 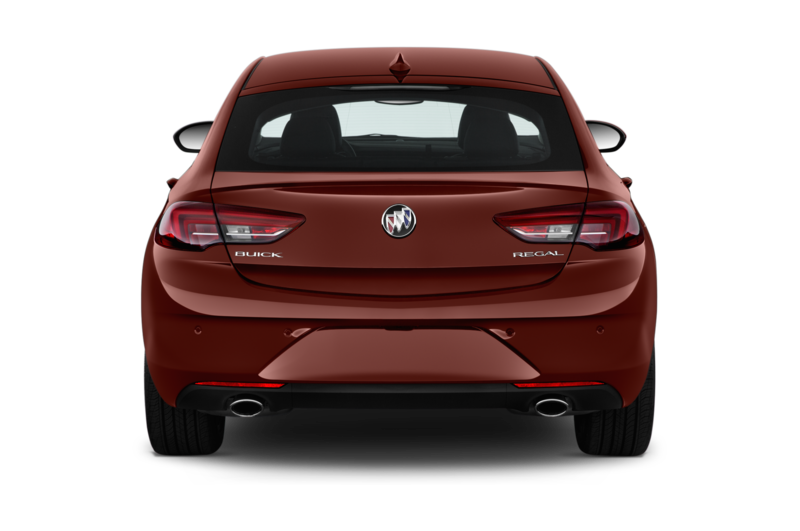 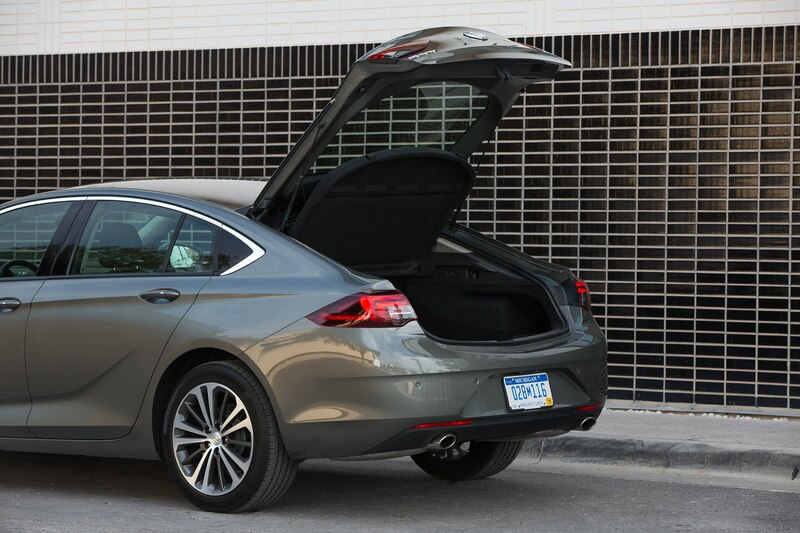 One nice feature that went un-tested is the Buick Beacon, which lights up the ground under the rear of the TourX where you need to place your foot to automatically open the liftgate. 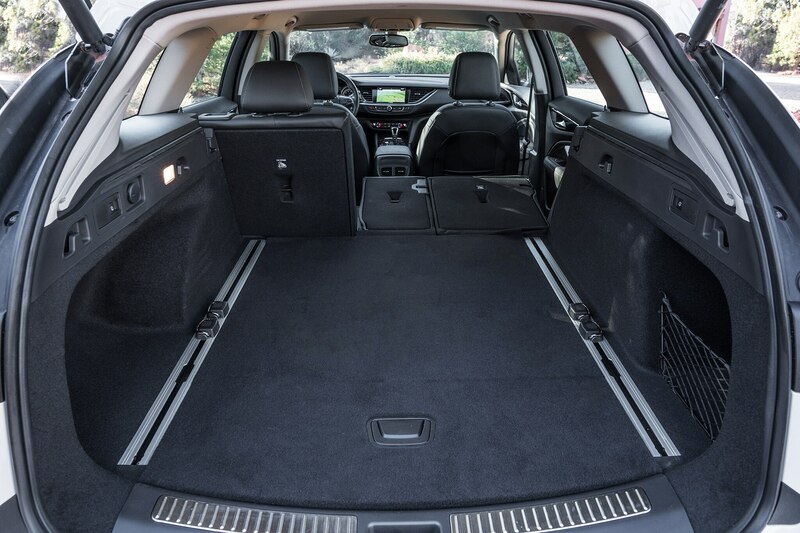 That tight-ish width between the wheel wells would make for a narrow third row, which in the tradition of 1960s-‘70s wagons would be rear-facing. 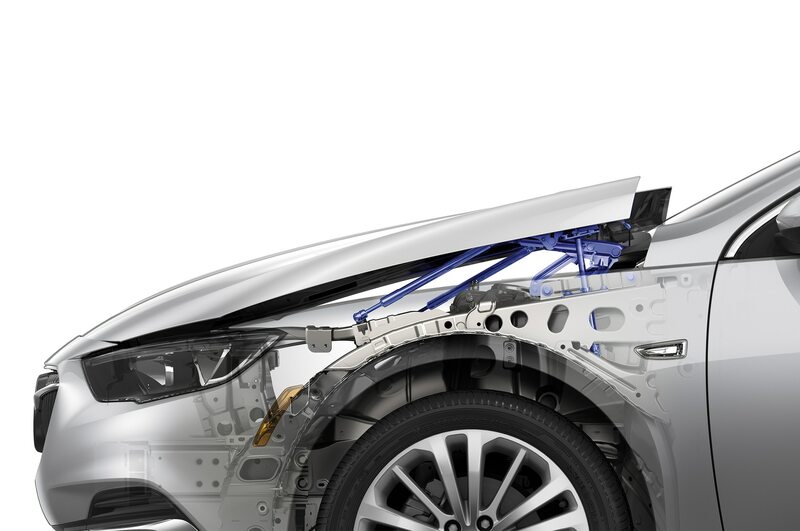 But today’s vehicles require more structure between the exterior sheetmetal and interior headliner for rollover protection, especially in models with long rooflines, and so only taller vehicles can provide the floor-to-headliner space for adequate third-row headroom. 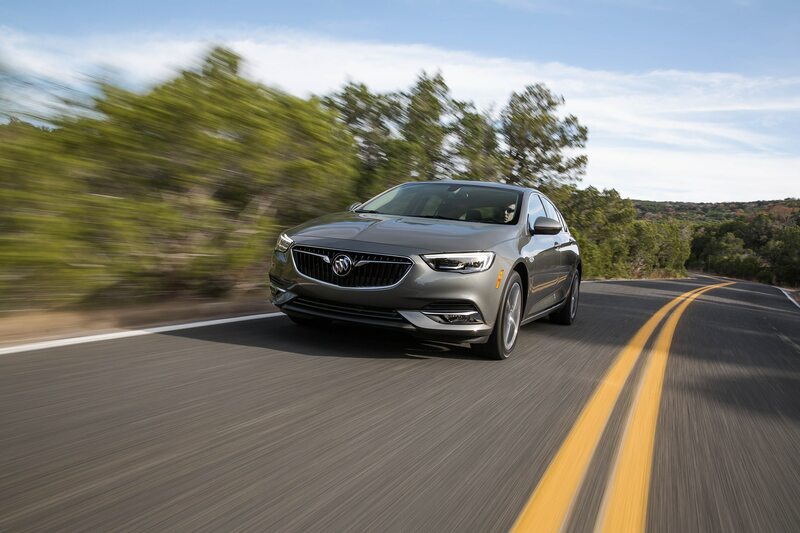 Second-row headroom in the Buick Regal TourX is excellent, however, and leg- and elbowroom are good, too. 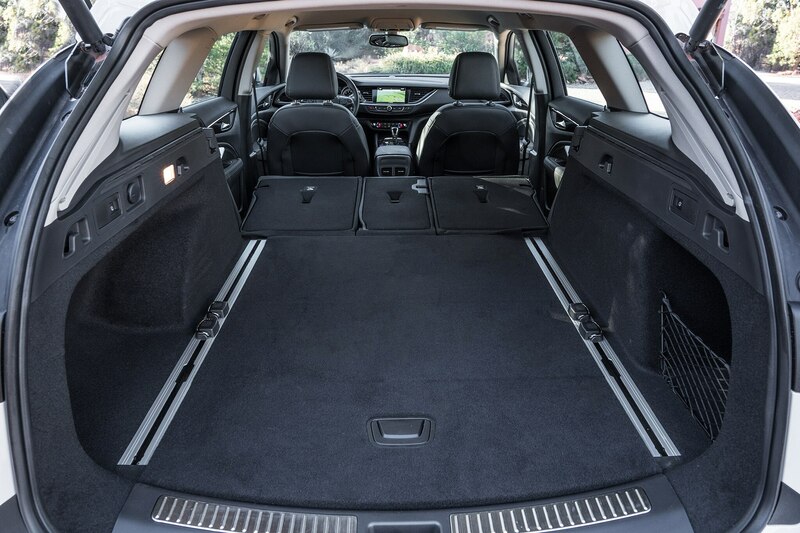 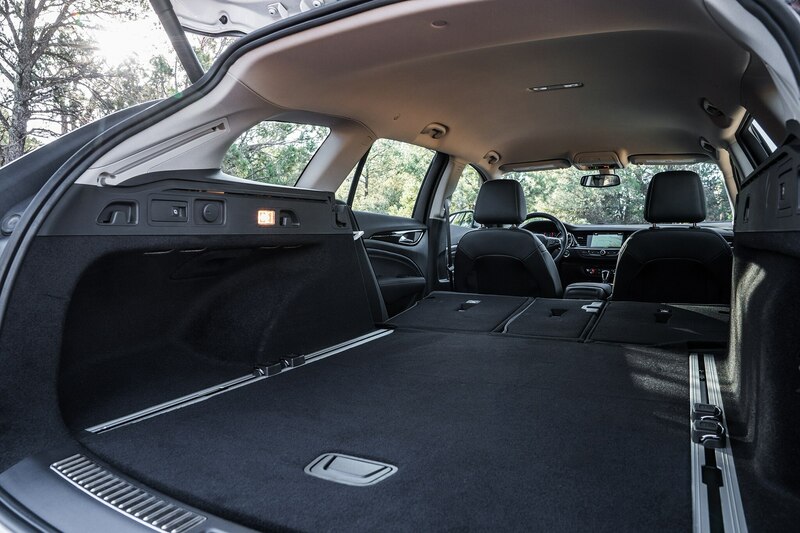 Though we didn’t try fitting three adults abreast in the rear seat, it surely could be done in a pinch, which means that like most SUV third rows, you wouldn’t want to try to fill the TourX’s second row for long trips. 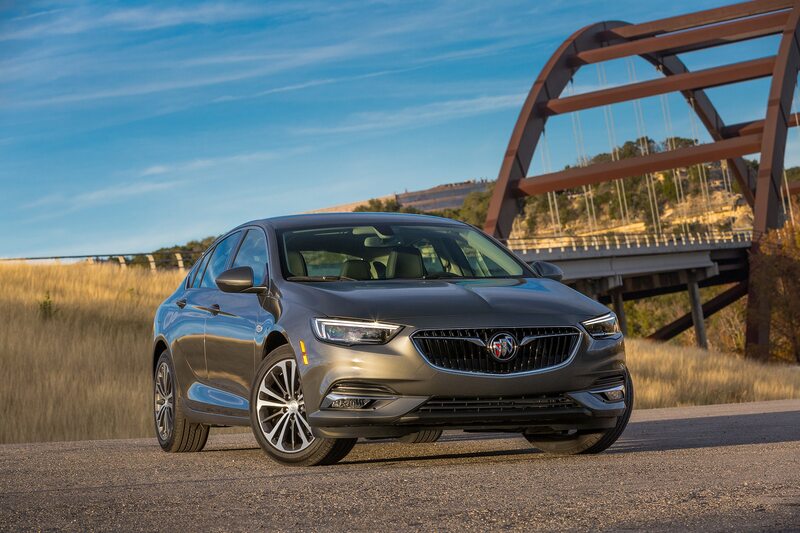 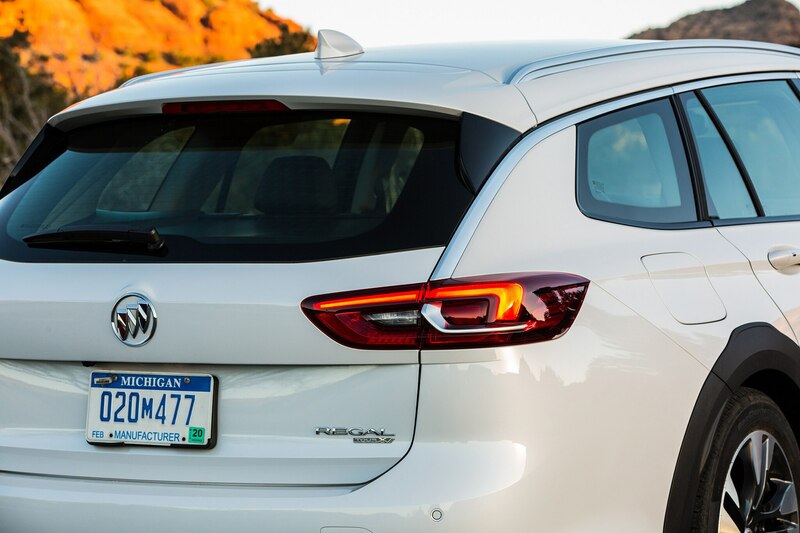 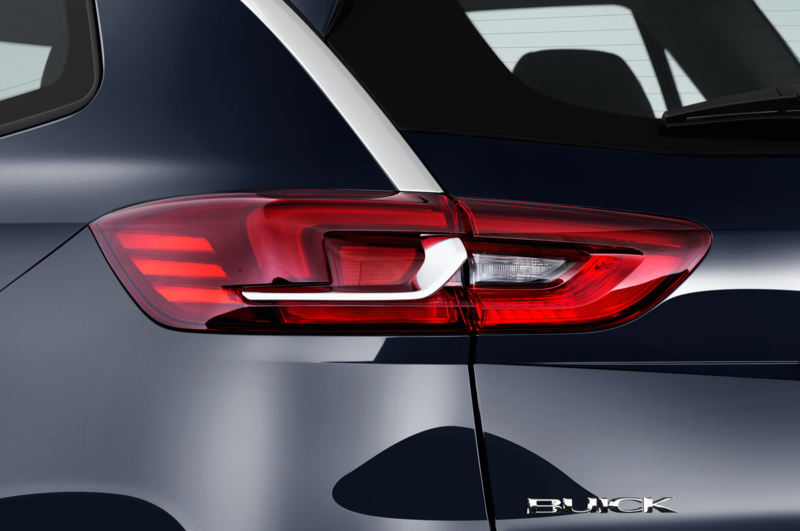 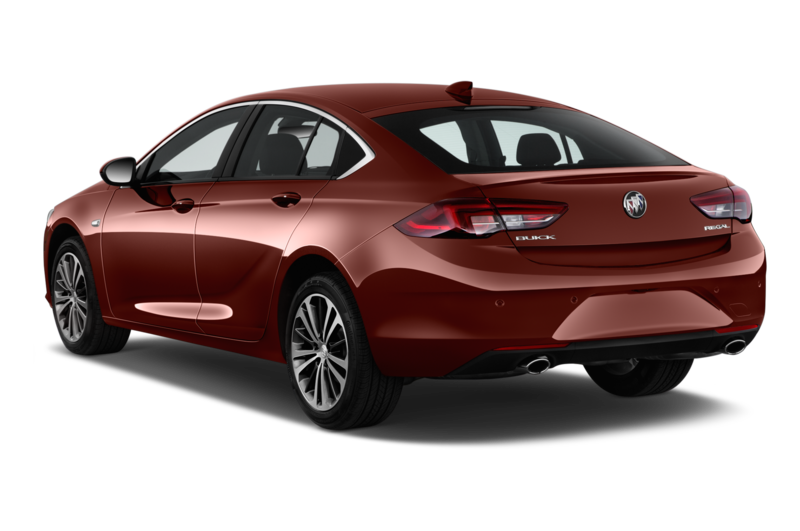 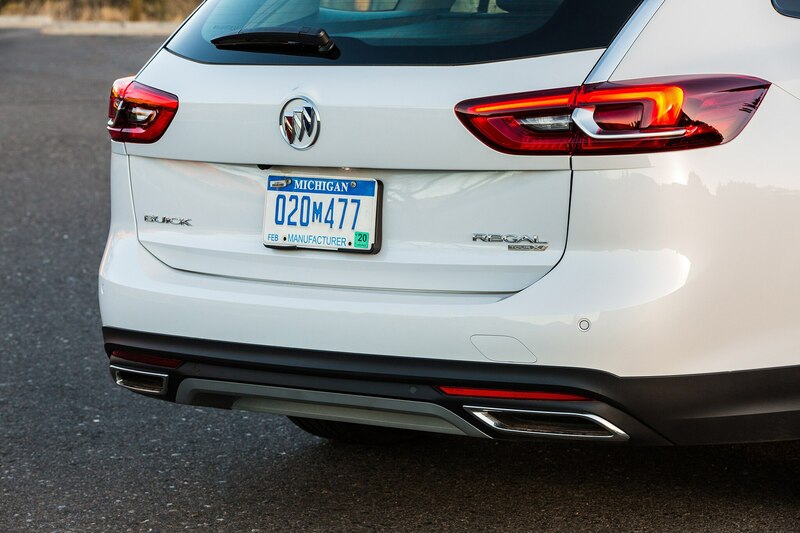 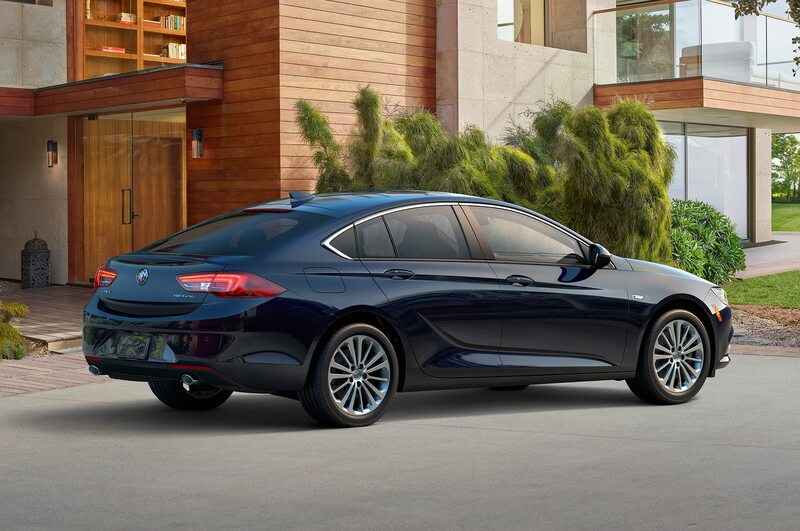 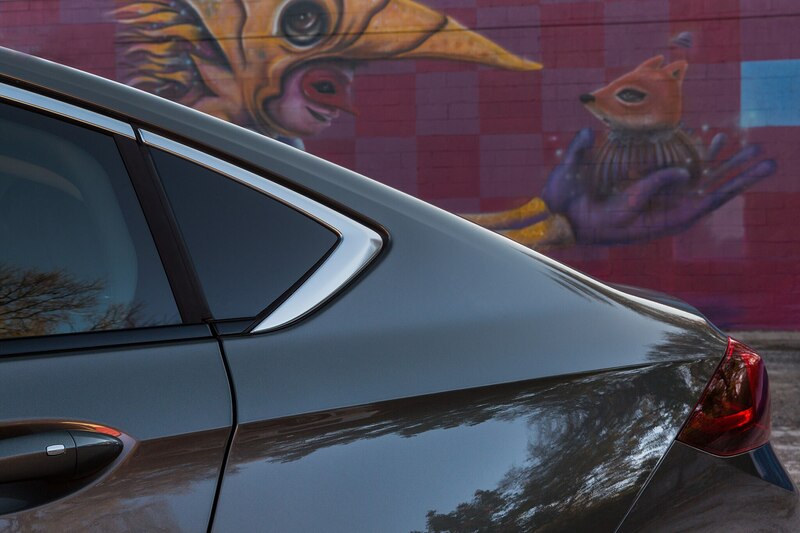 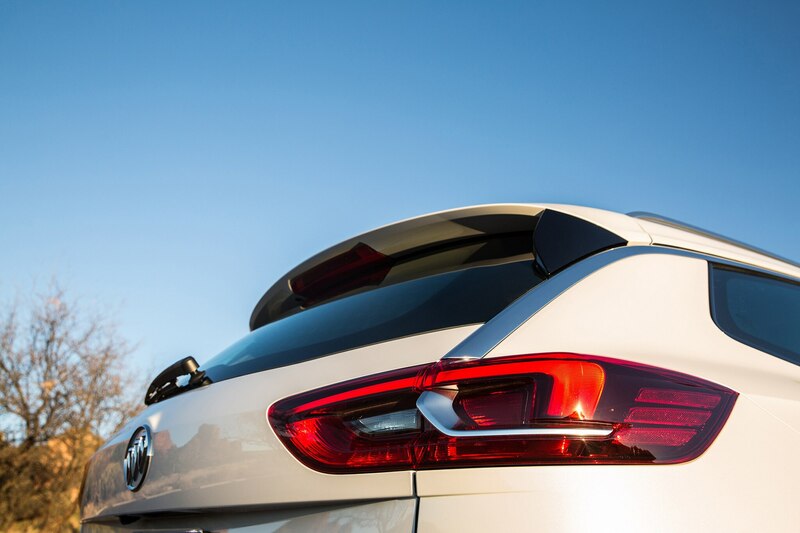 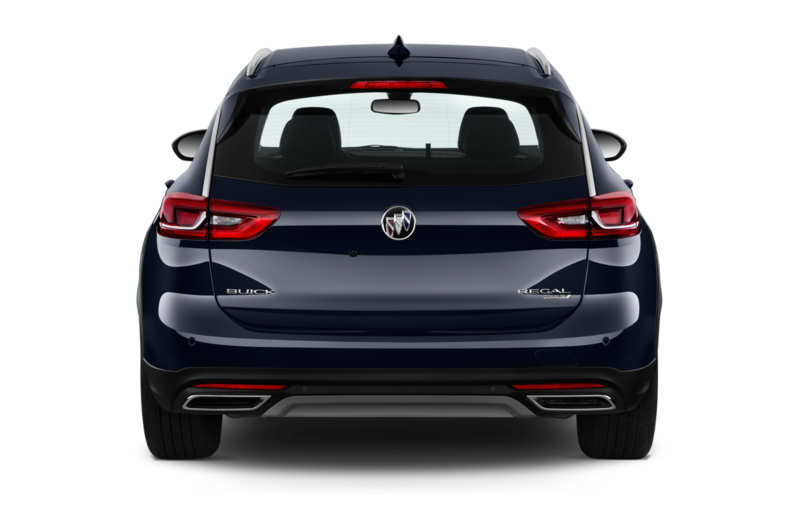 Compared with the Buick Regal Sportback, the TourX is 3.4-inches longer in overall length, and 1.1-inches taller. 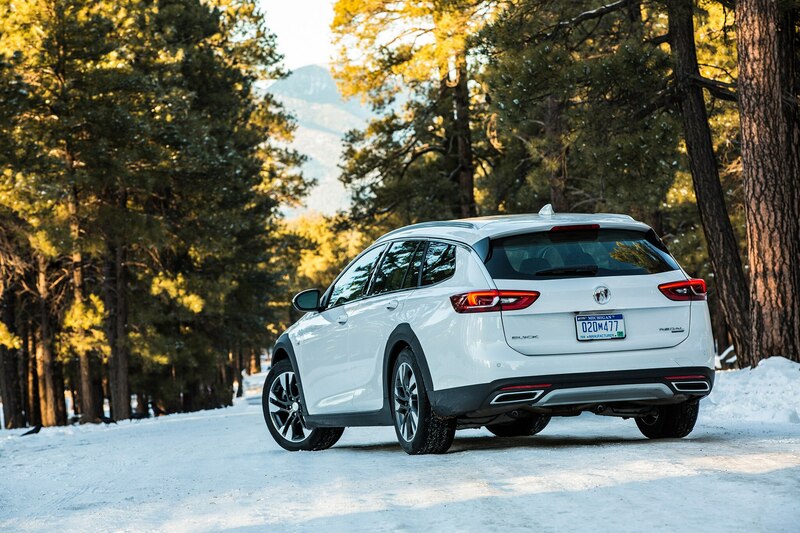 It’s just 1.1 inches shorter overall compared with the full-size LaCrosse, and it means that the Regal TourX gets some very nice proportions which, to beat a long-dead horse, could only be improved with the rear-wheel-drive dash-to-axle proportions of the General Motors Alpha platform out of which Buick has long been screwed. 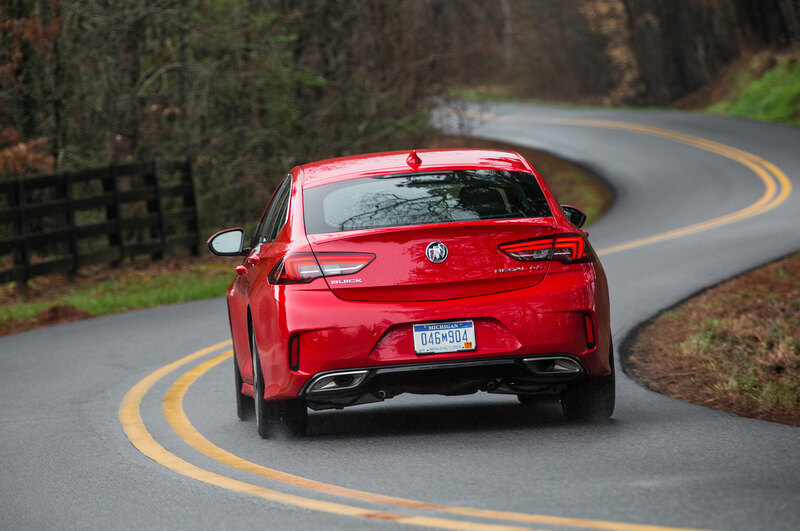 A rear-wheel-drive platform might make dynamics a bit more interesting as well by moving the torque bias to the rear. 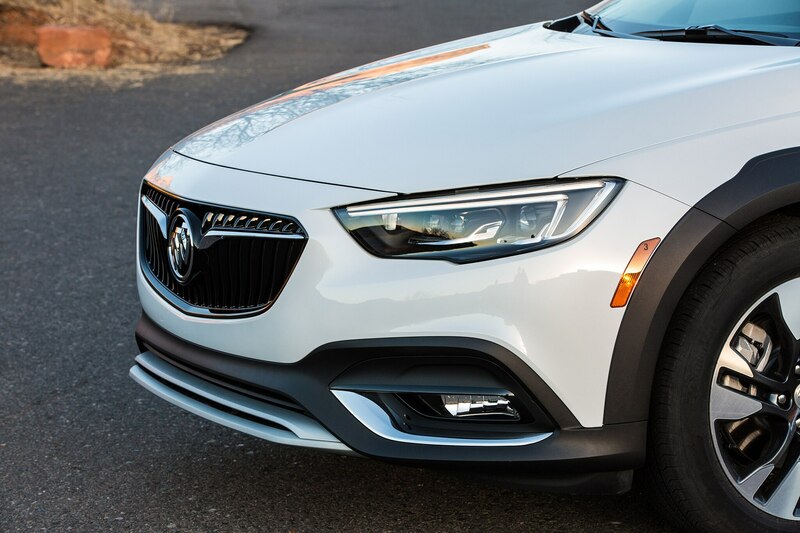 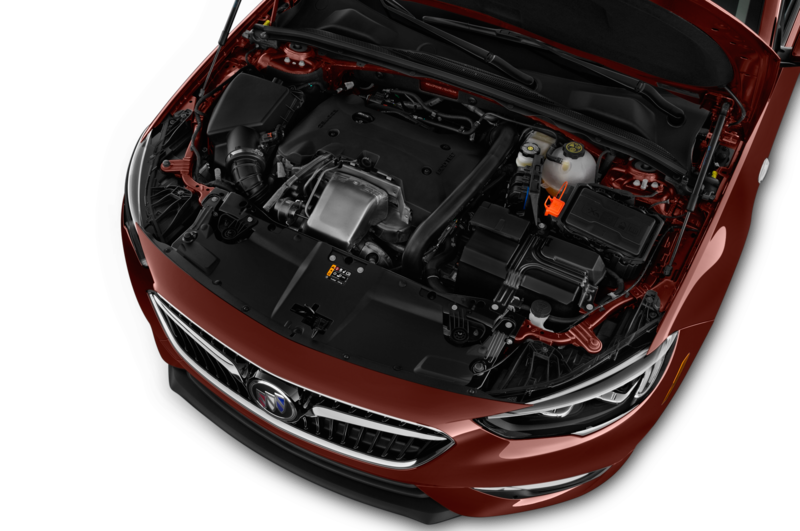 Unlike the FWD standard/AWD optional Regal Sportback hatchback, the TourX comes only with a twin-clutch intelligent all-wheel-drive system that torque-vectors its way around corners and can theoretically channel 100 percent of torque to a single wheel if the other three lose grip. 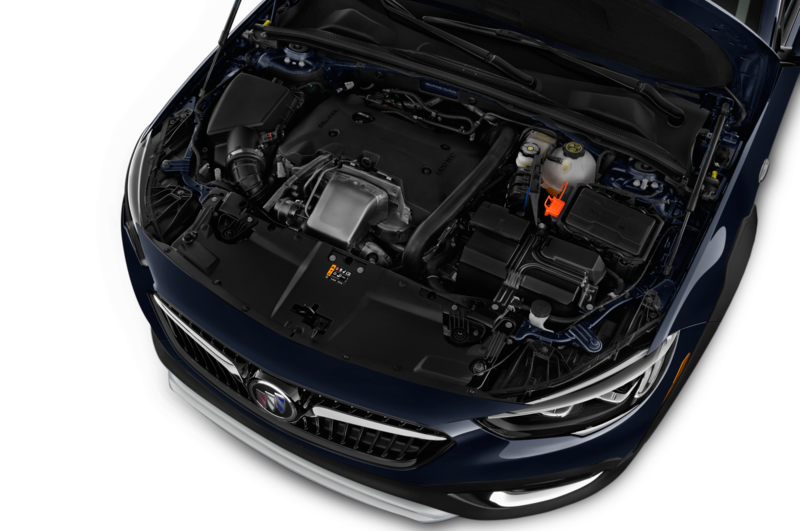 As with the AWD versions of the Sportback, the TourX comes with an Aisin eight-speed automatic as the only transmission choice. 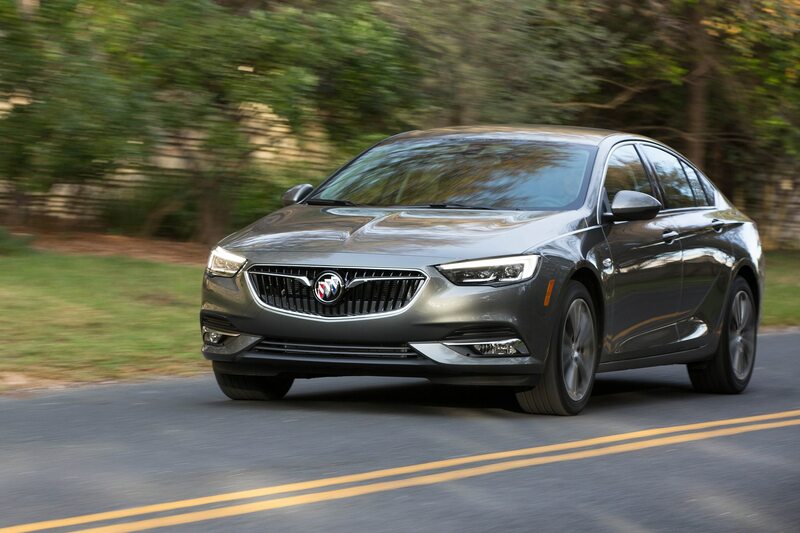 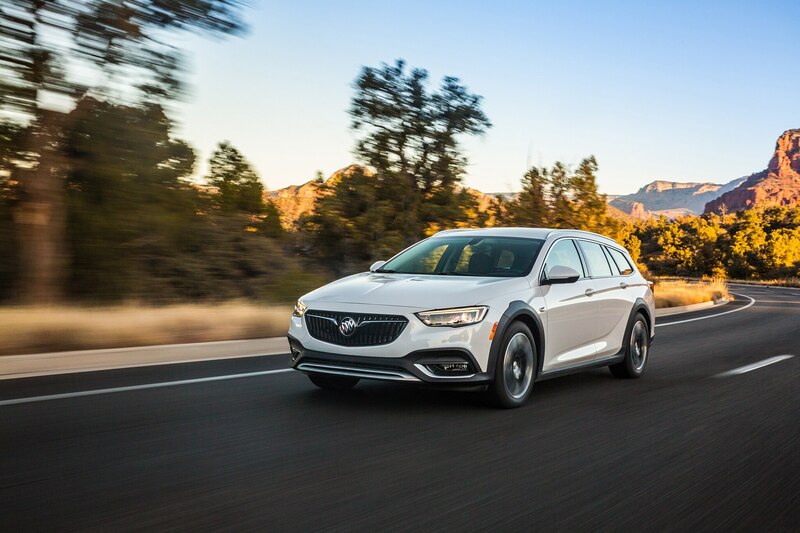 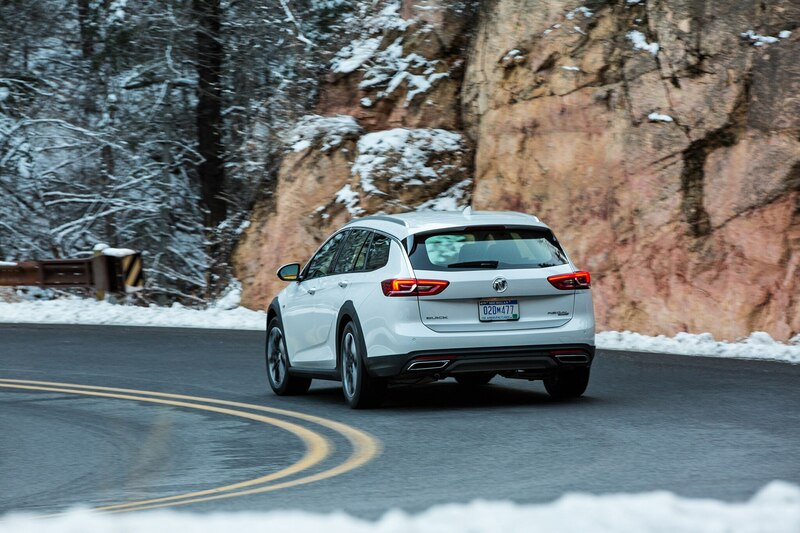 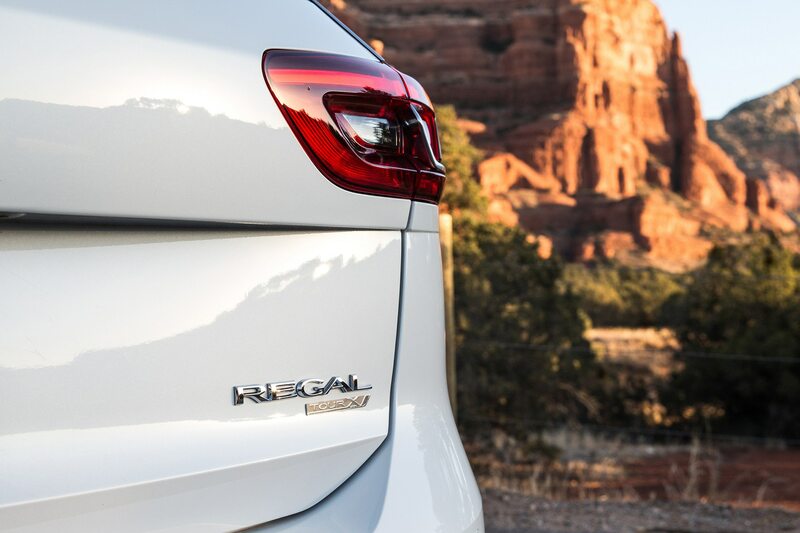 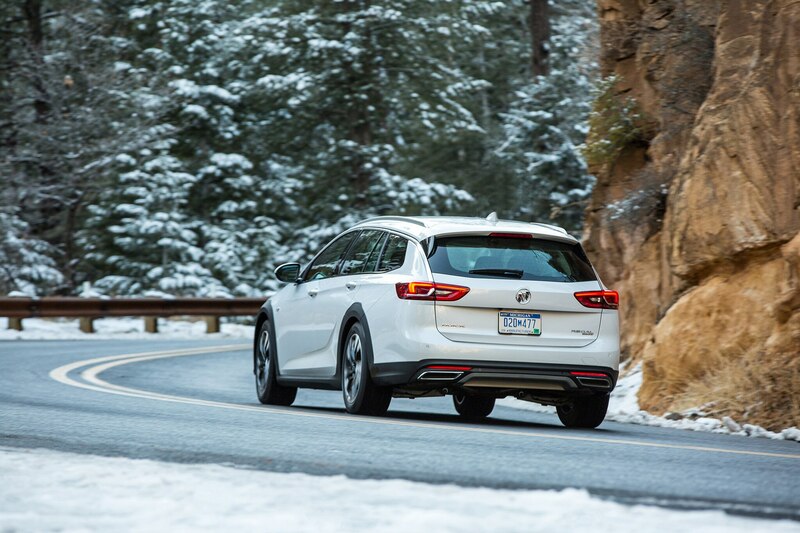 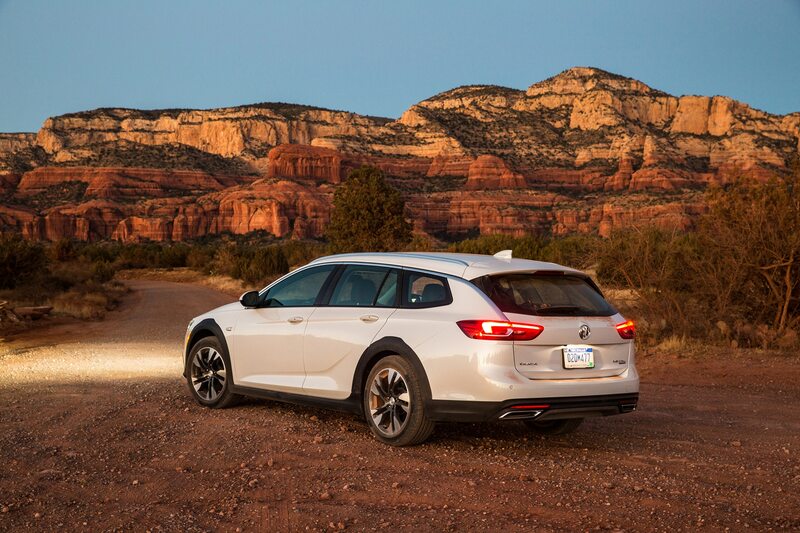 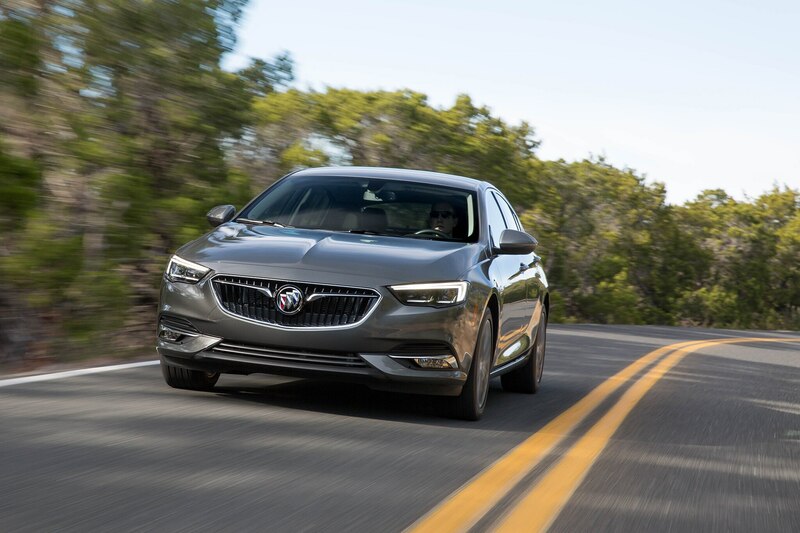 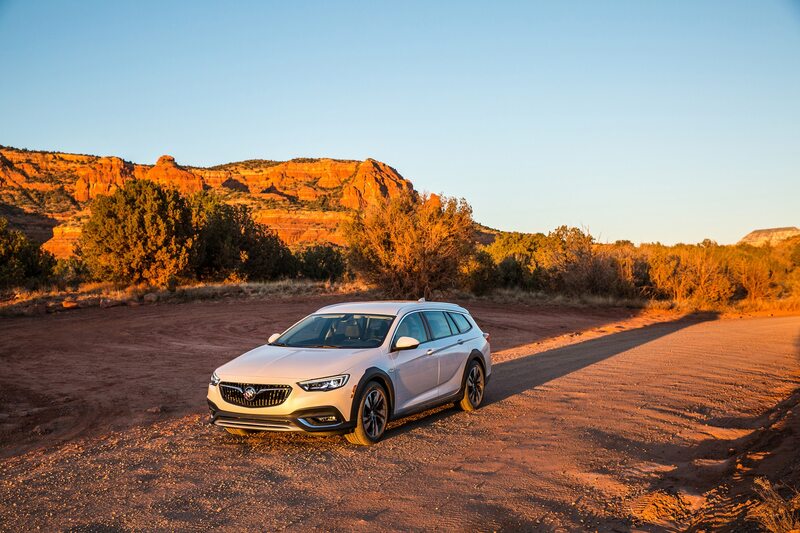 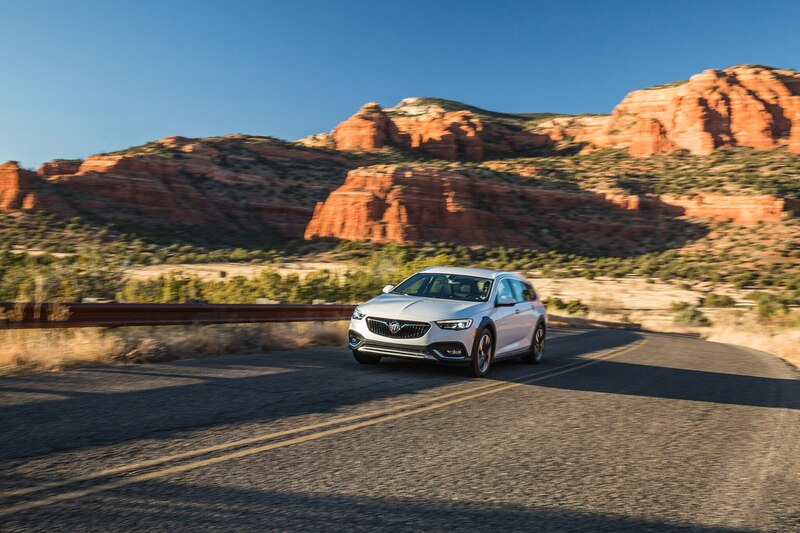 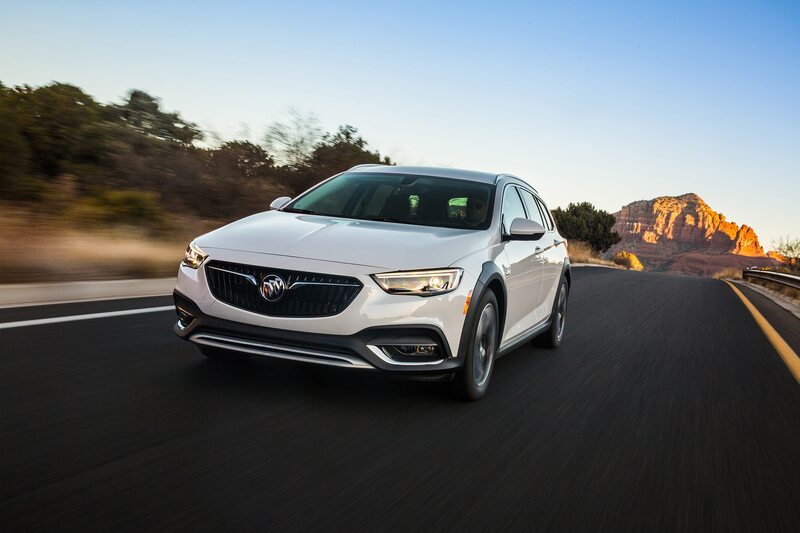 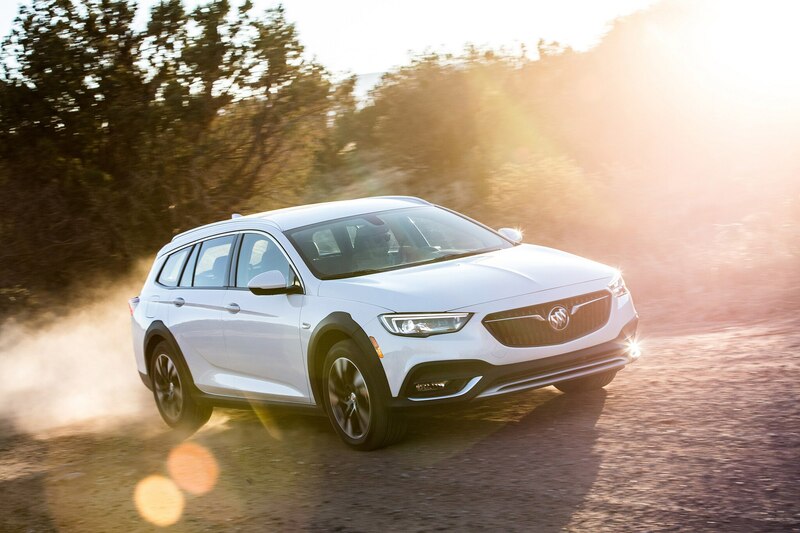 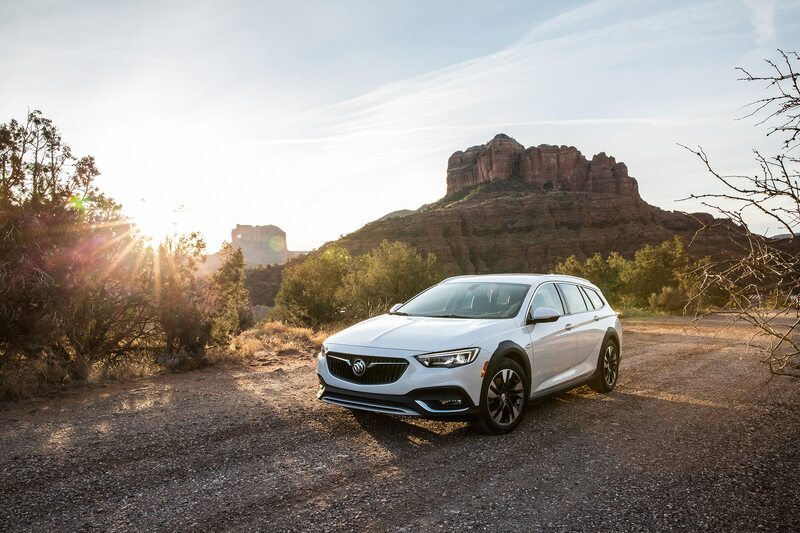 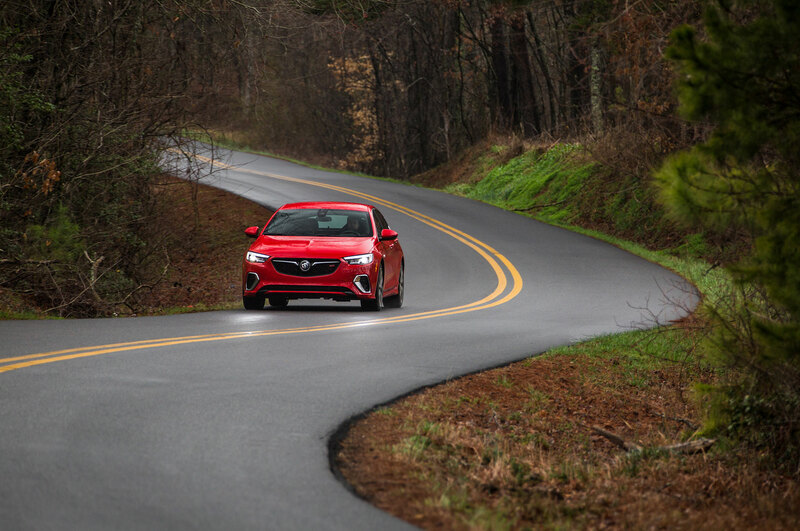 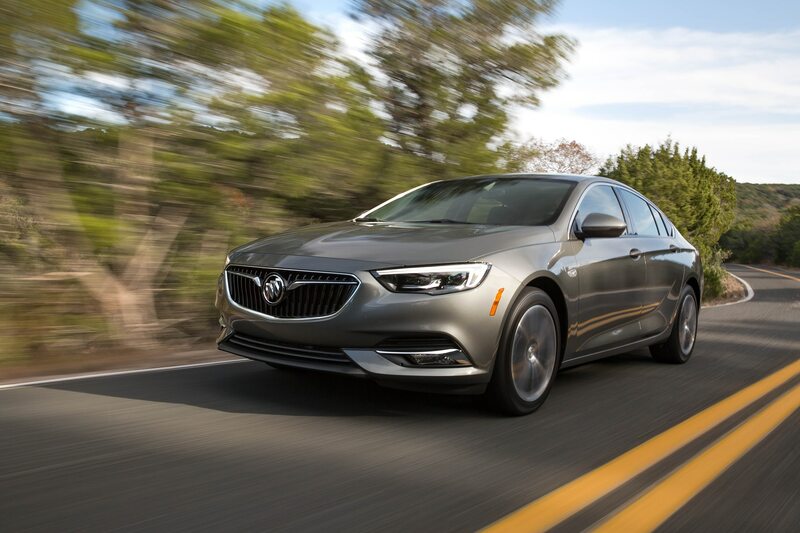 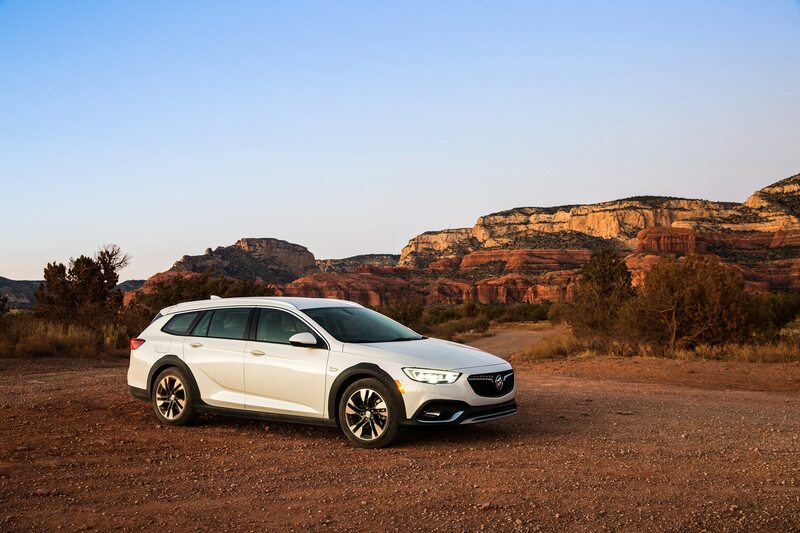 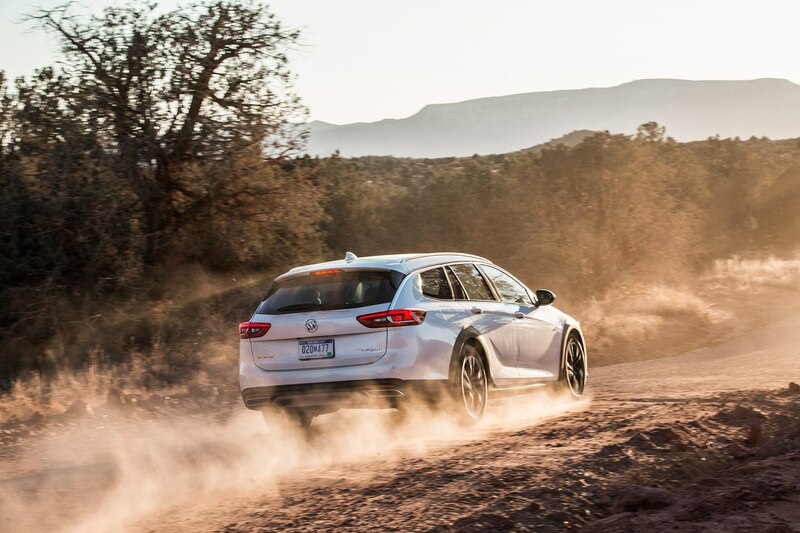 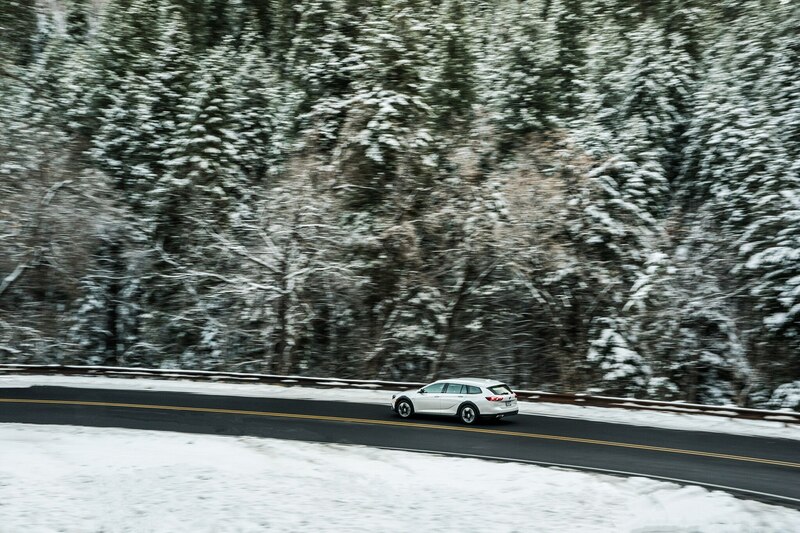 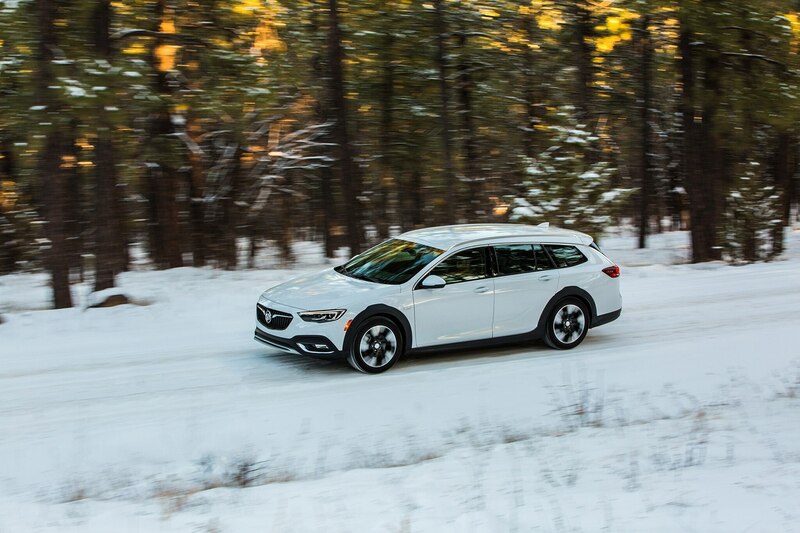 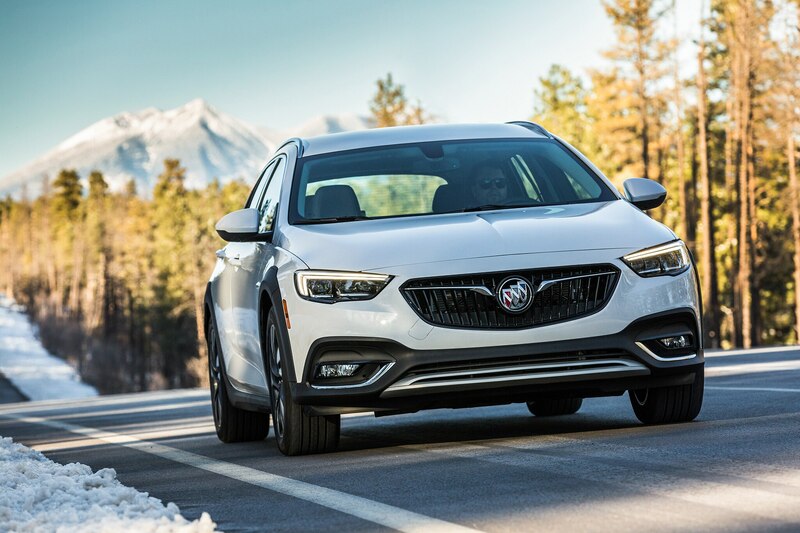 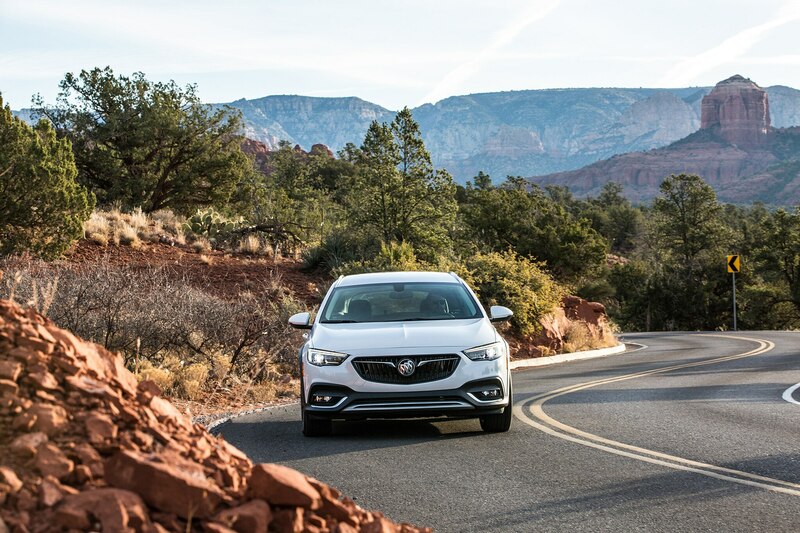 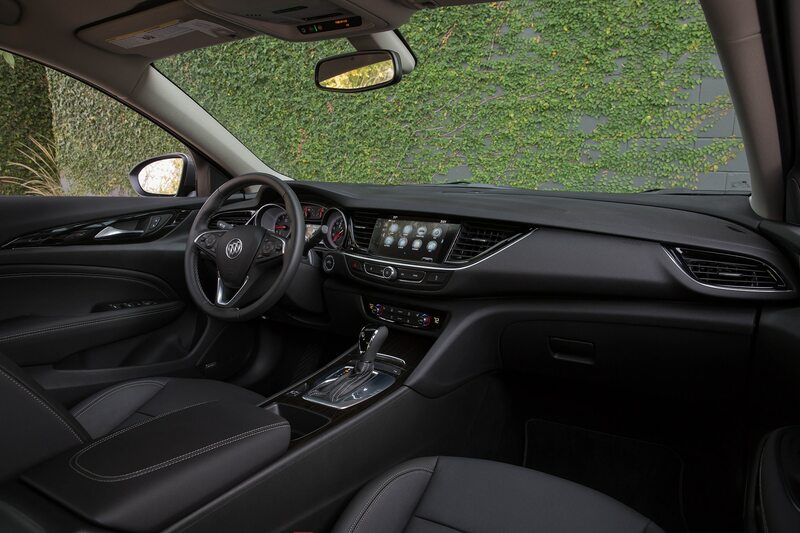 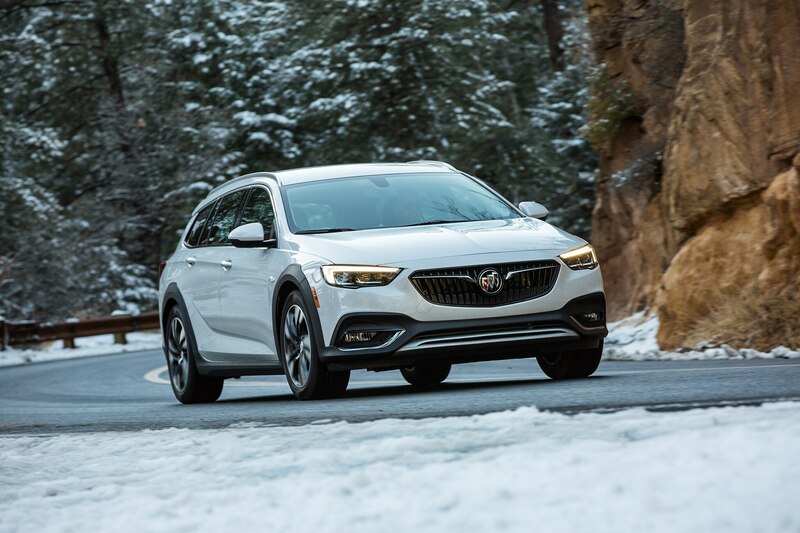 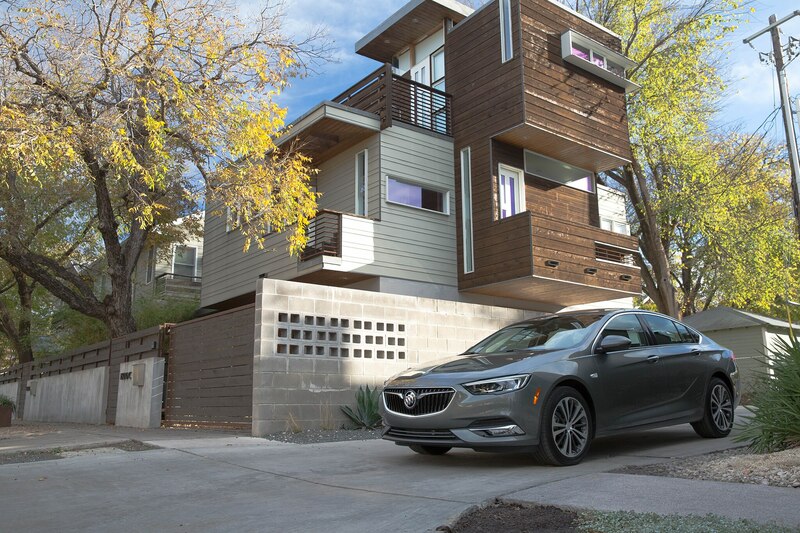 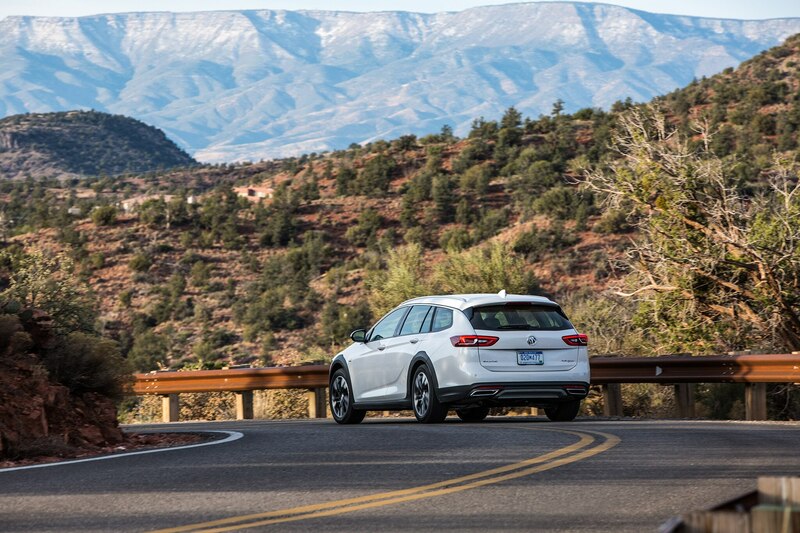 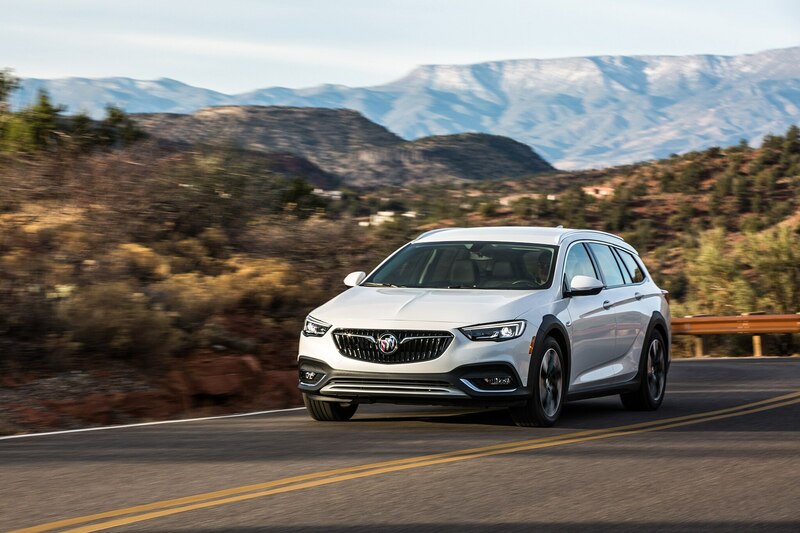 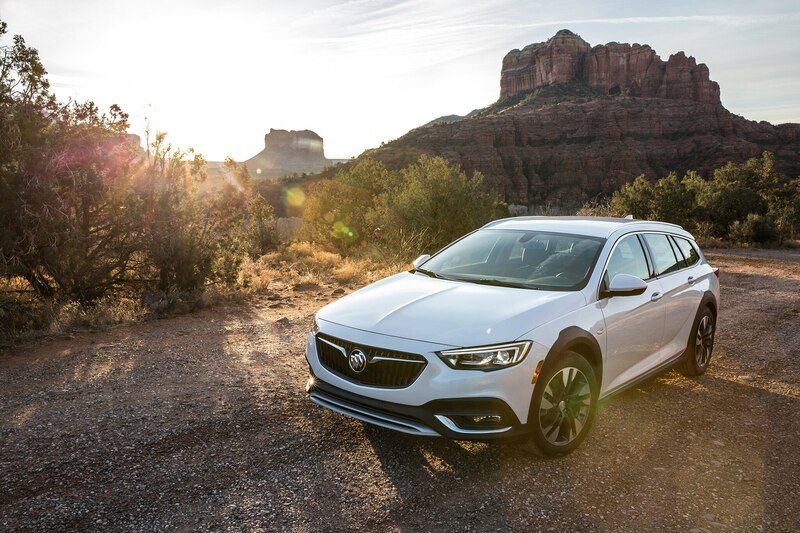 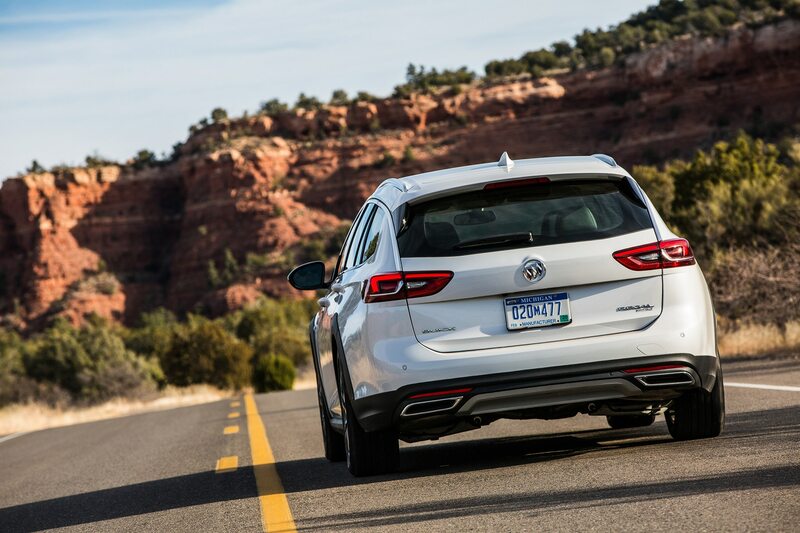 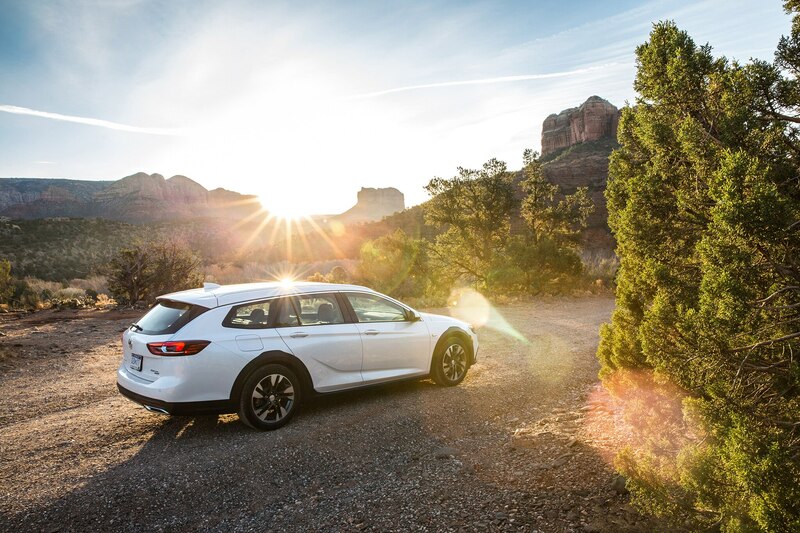 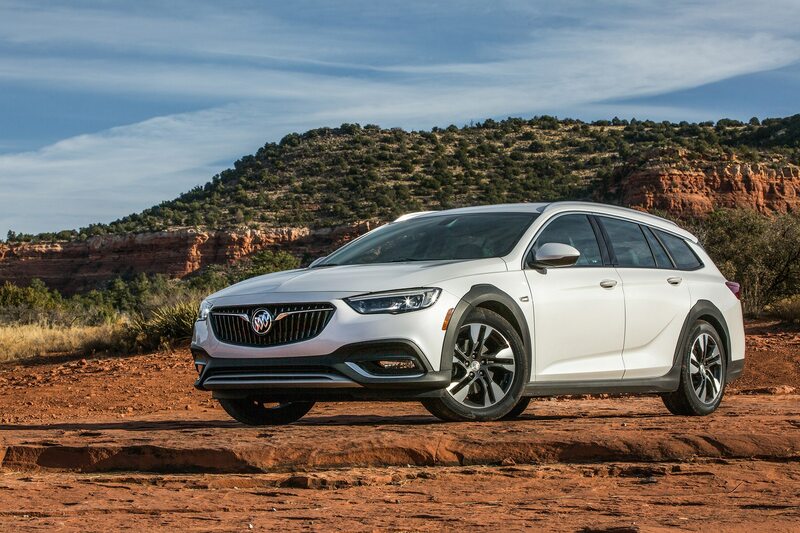 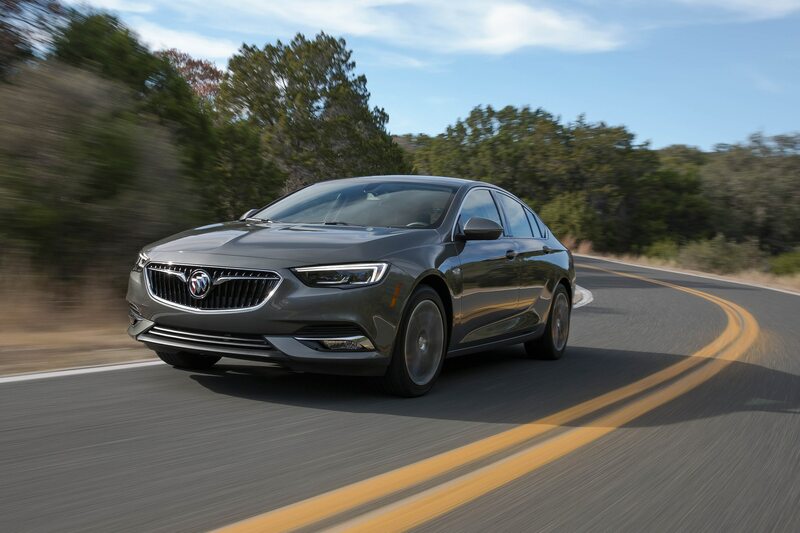 On the gentle sweepers outside of Sedona, the Buick Regal TourX is comfortably soft and well-controlled, though on rougher roads in Phoenix, moderate stiffness over certain bumps and washboards hinted at sportier handling than it has. 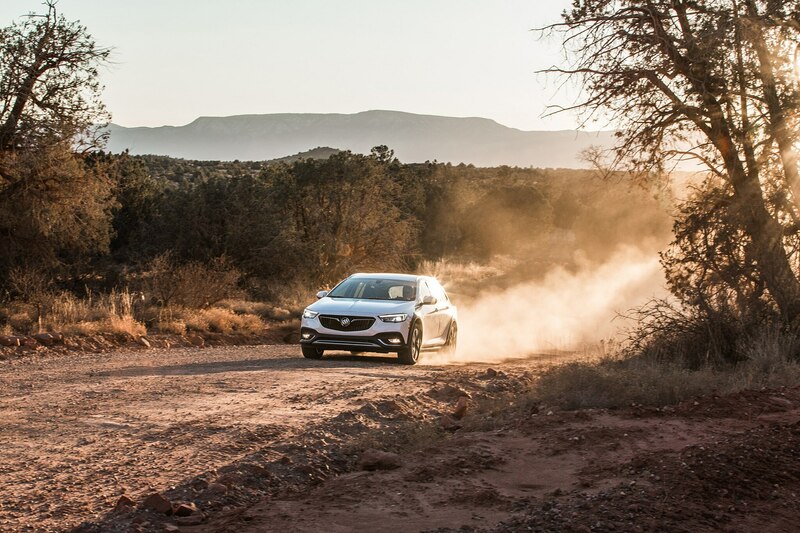 There’s nothing in the TourX’s dynamics to prompt any rally driving moves. 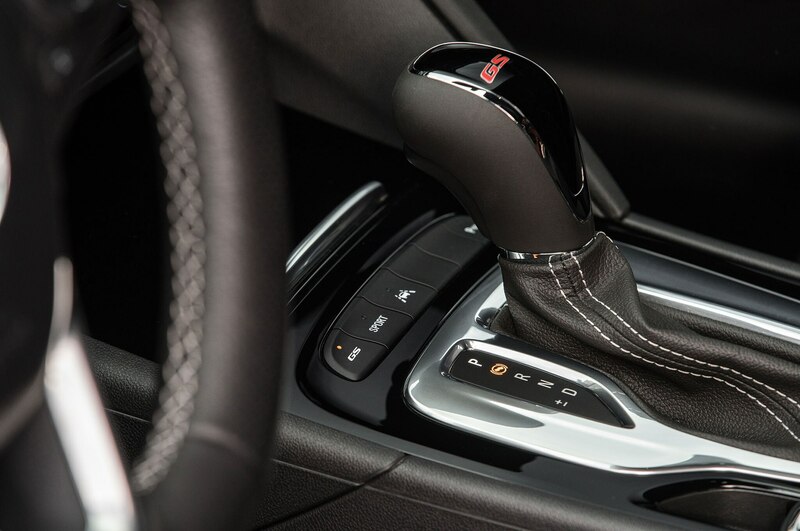 But steering is precise and offers good feel and feedback, and the 2.0-liter turbo is quick. 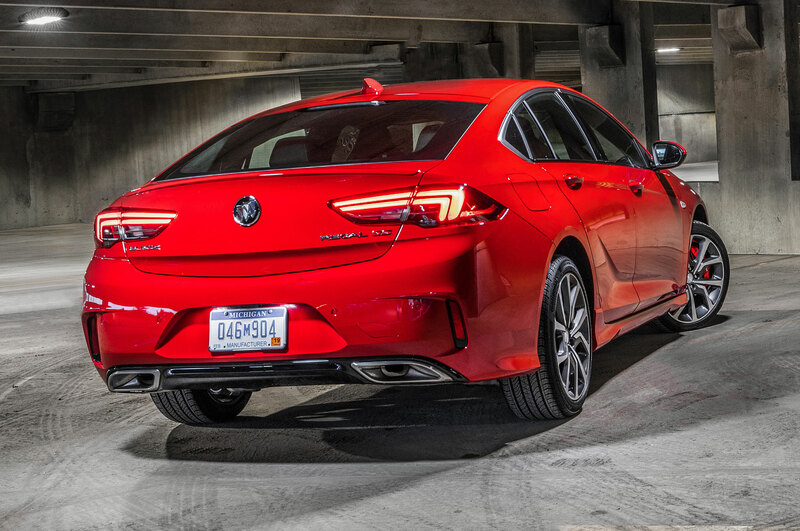 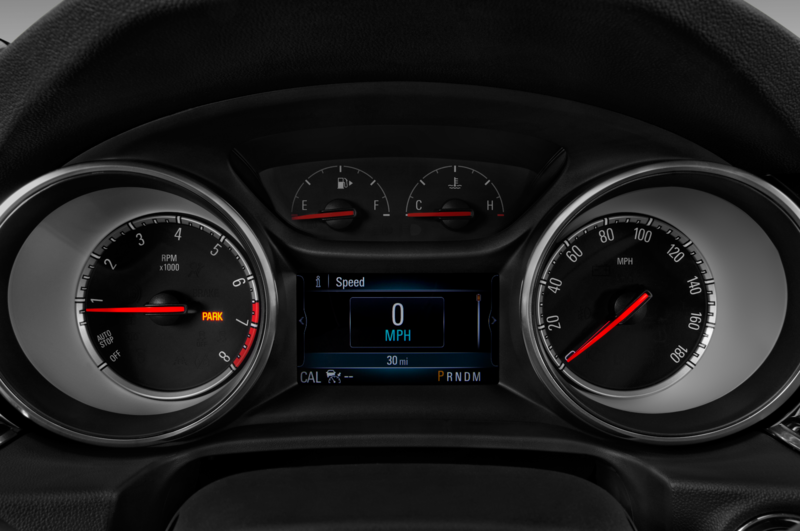 There’s no noticeable lag at launch, and torque-steer is minimal thanks to that intelligent AWD, though with 295 pound-feet peaking between 3,000 rpm and 4,000 rpm, and its 250 horses peaking at 5,500, the brisk acceleration comes in early and levels past the torque peak. 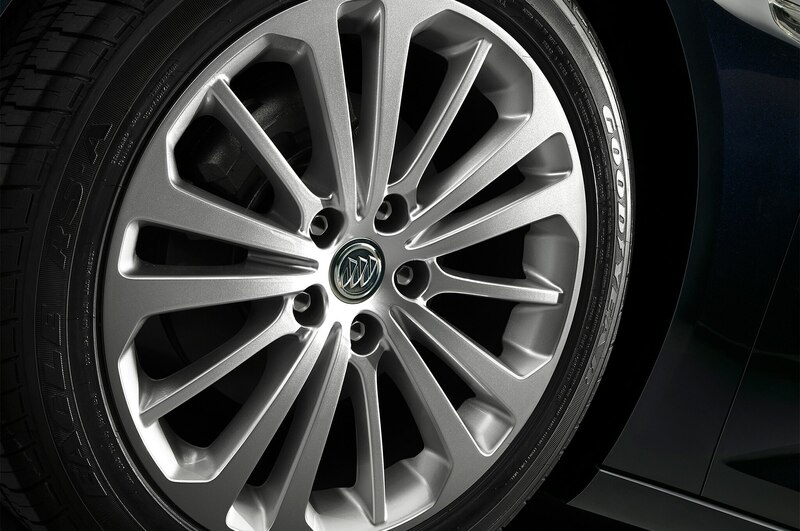 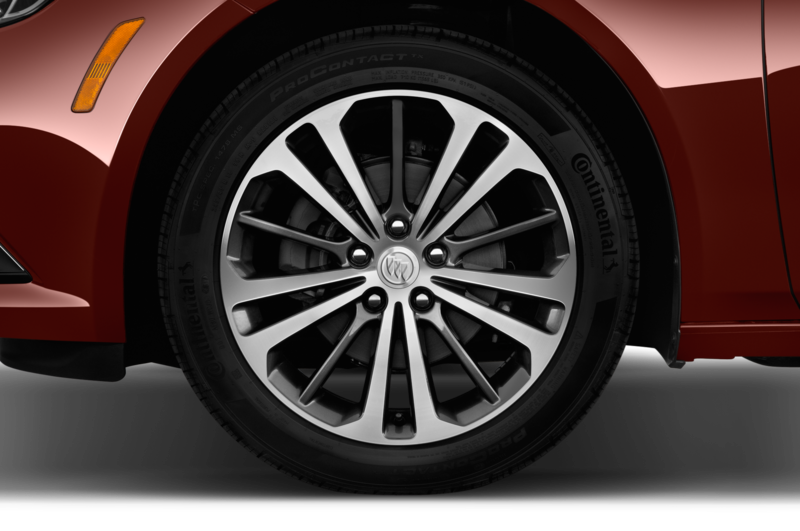 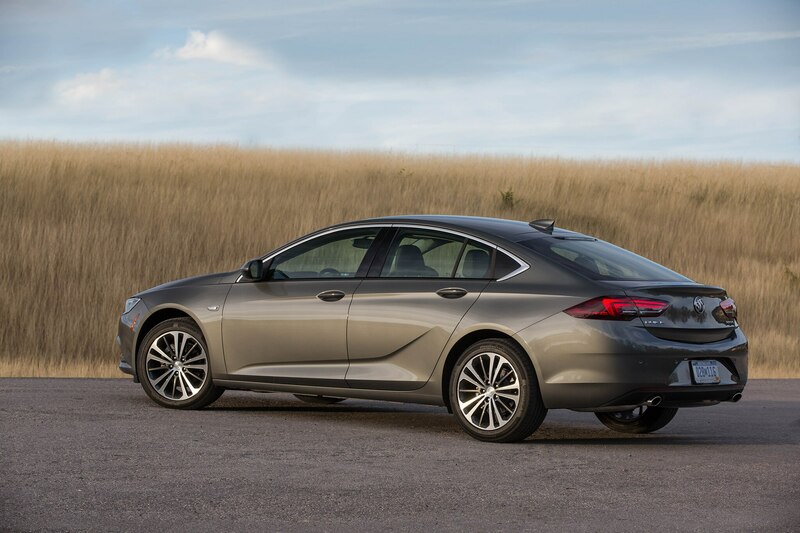 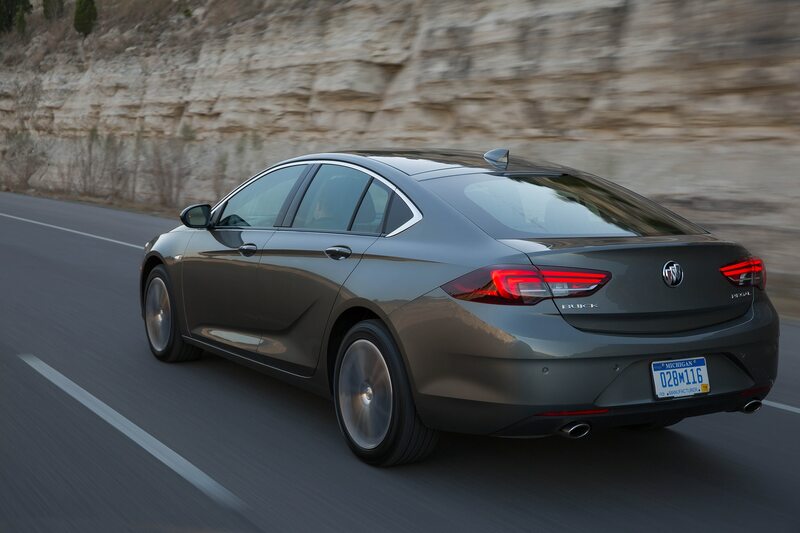 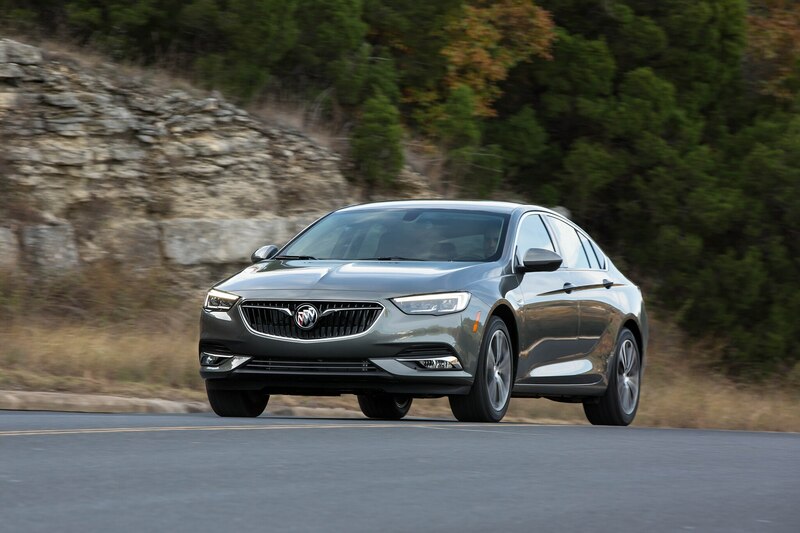 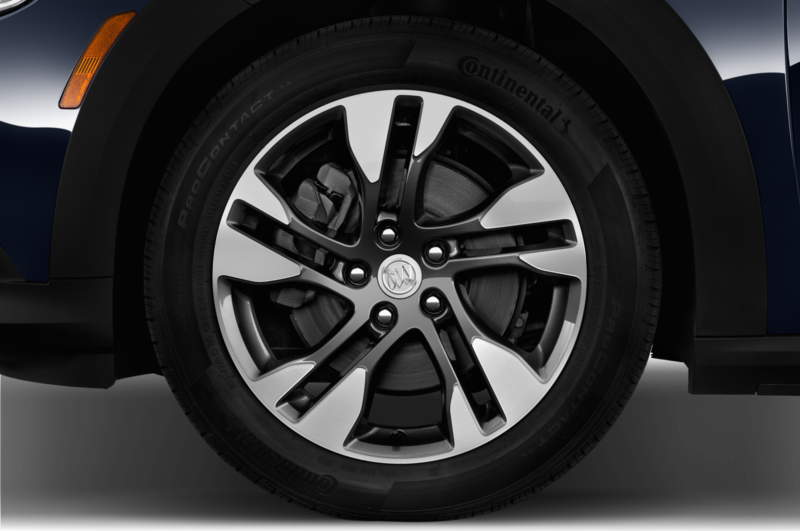 Buick is known for its “Quiet Tuning,” of course, and compared with the Opel/Vauxhall Insignia with which it shares its design and German assembly line, the main QT component in this case consists of insulating foam inside the Continental tires, which our pre-production testers did not have. 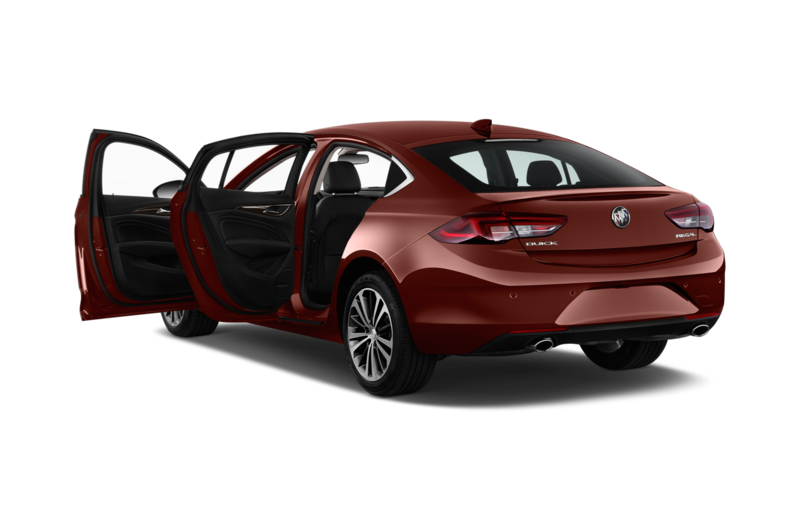 There’s also an active noise cancellation system and QT acoustics. 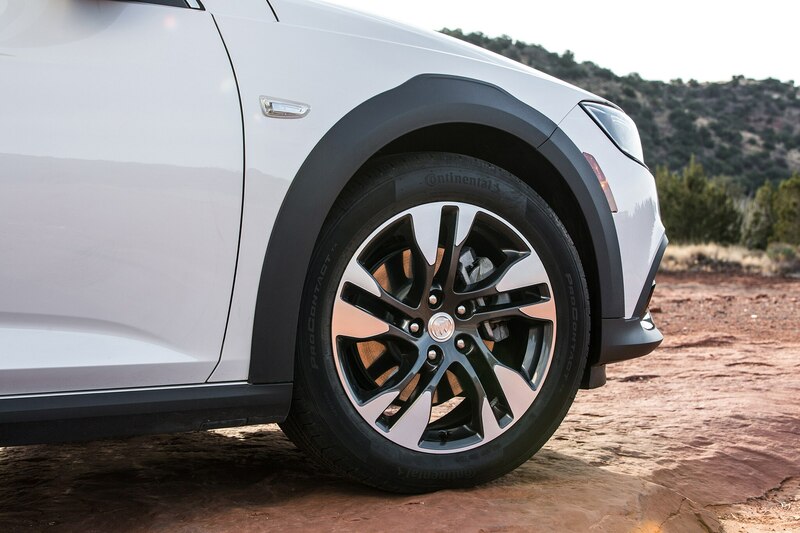 The right tires or no, the car is quiet and smooth on Arizona highways, with just a tad bit of turbo whistle making itself known about 2,500 rpm. 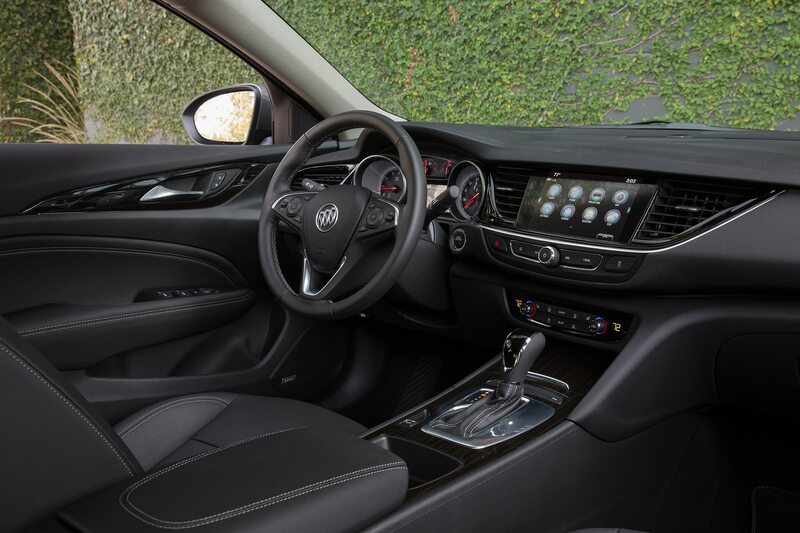 Interior fit and finish is excellent, with a rather minimalist thin horizontal-style dash broken up by an eight-inch touchscreen and a standard 4G LTE Wi-Fi hotspot and Apple CarPlay and Android Auto capabilities. 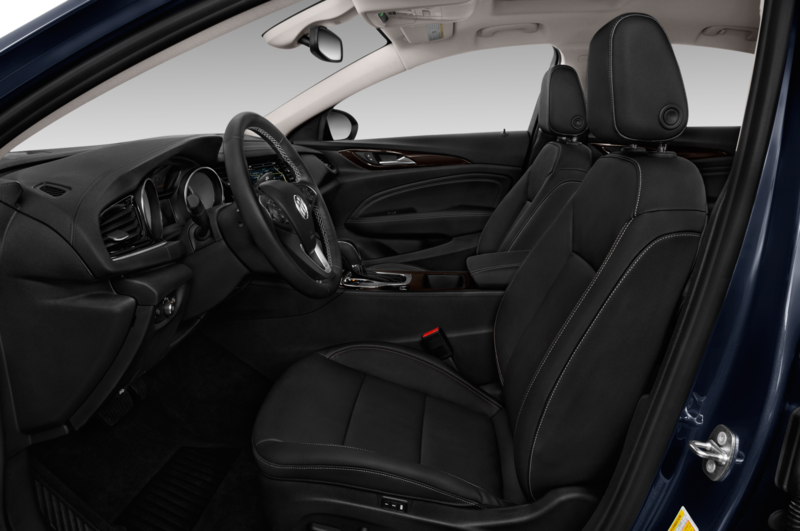 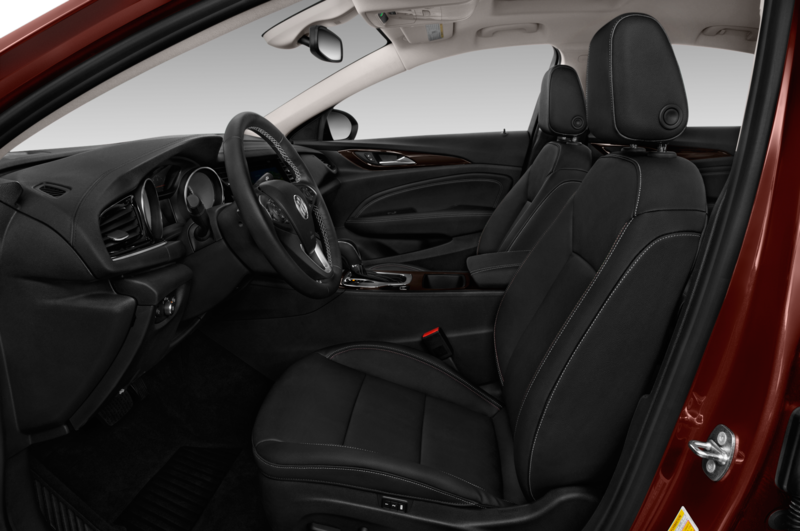 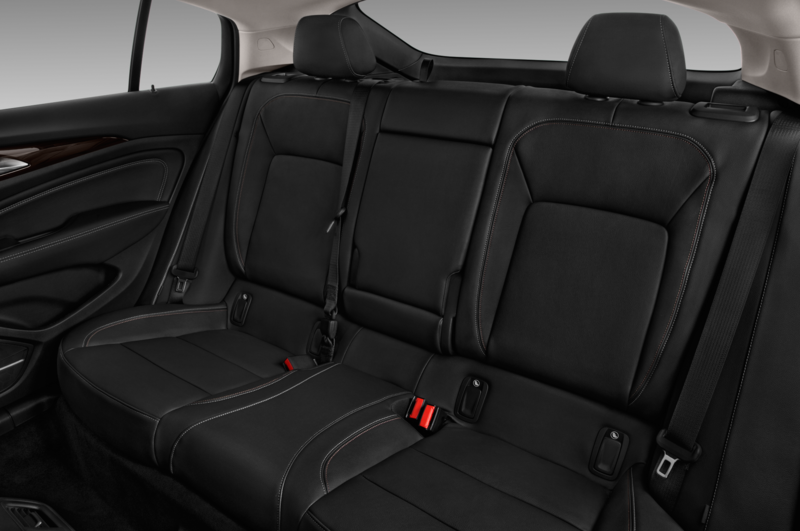 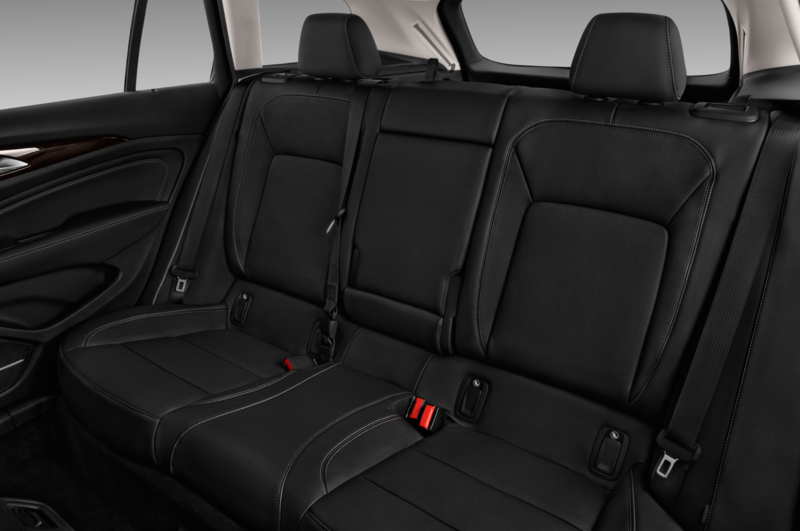 Power lumbar control for driver and front passenger is part of the $1,725 Driver Confidence Package Number 1. 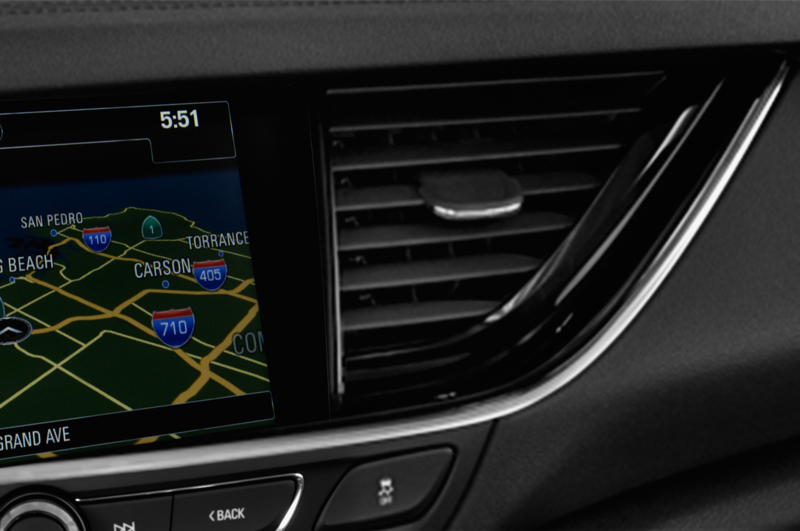 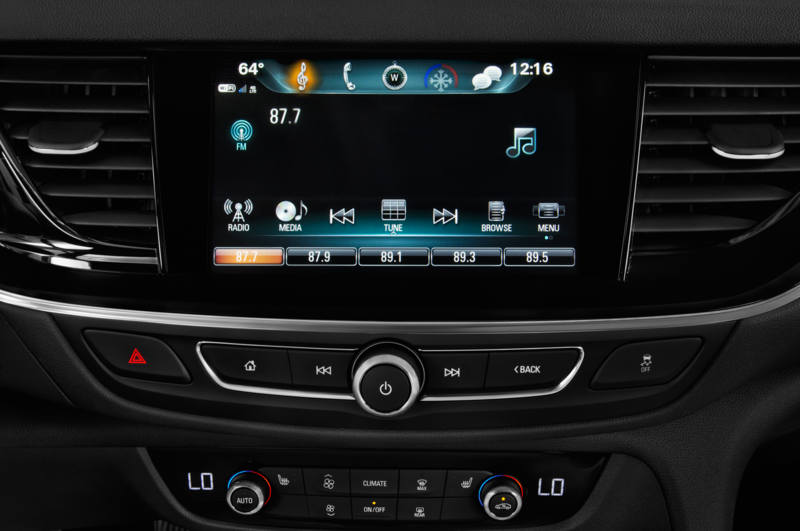 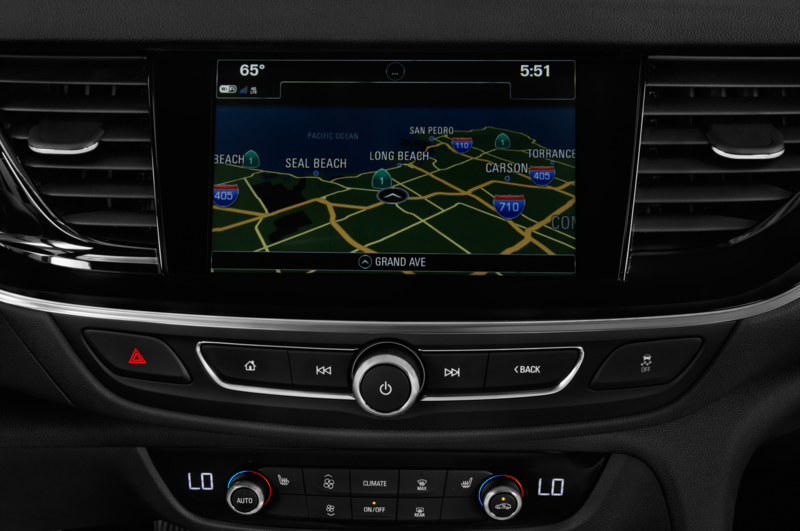 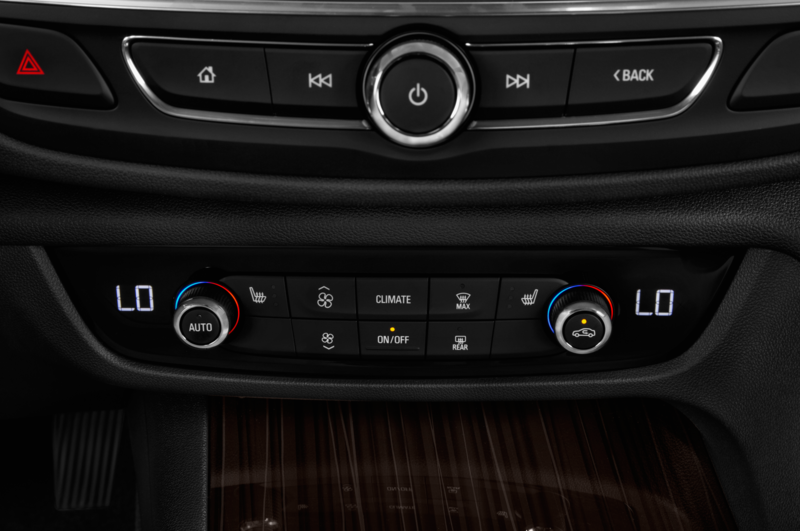 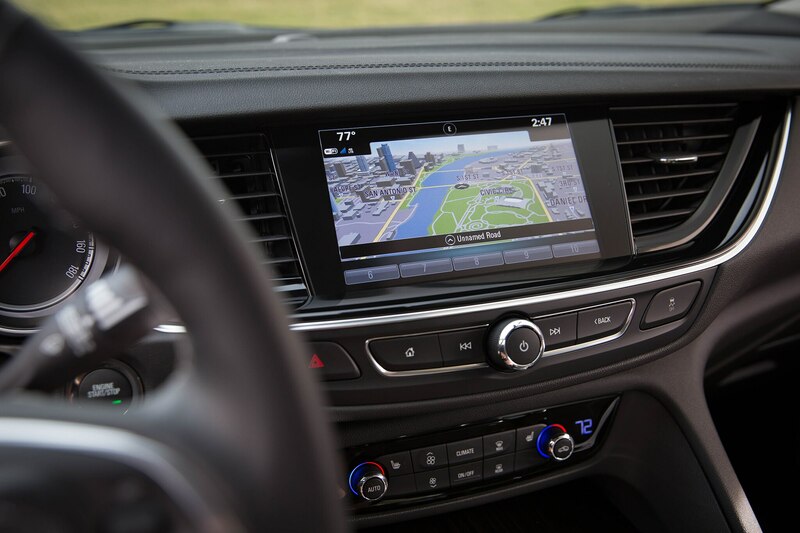 An infotainment system with navigation is part of a $1,095 package that also throws in a premium Bose audio system and high-definition radio. 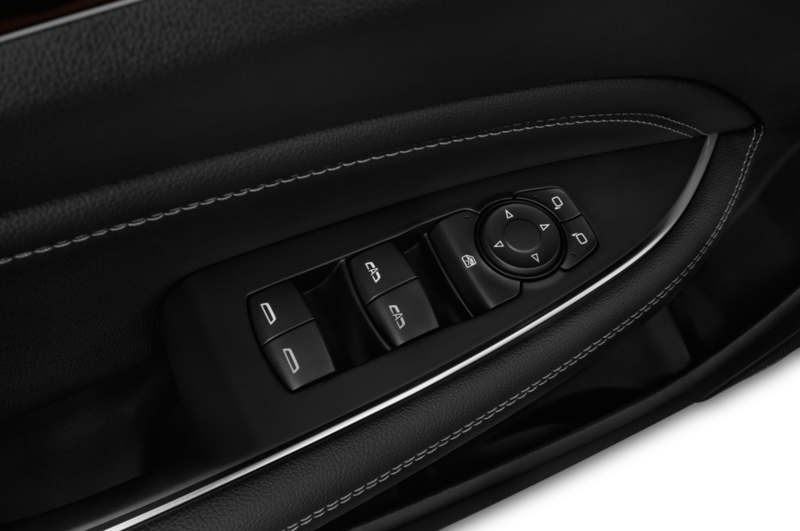 All but one of three examples sampled for this first drive came with black interiors with subtle wood-style accents. 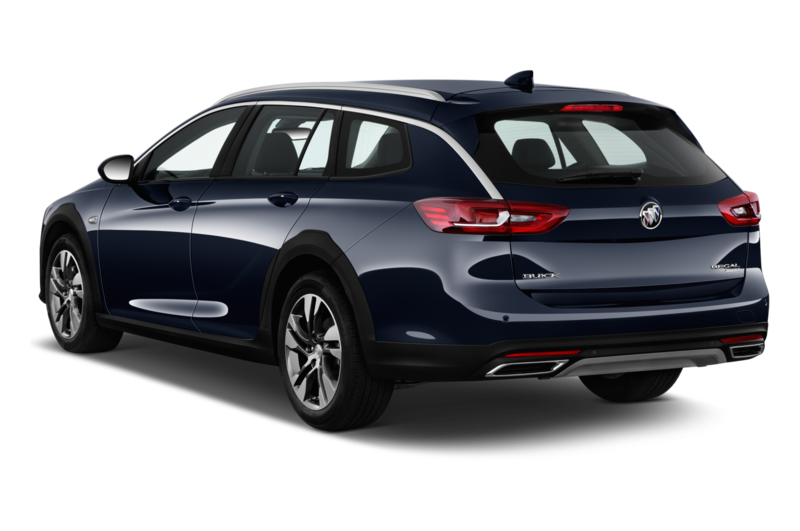 The third has a two-tone dash, but it’s simply black on top of light beige, falling well short of the nicely padded saddle-accent interior available in the Buick Enclave Avenir. 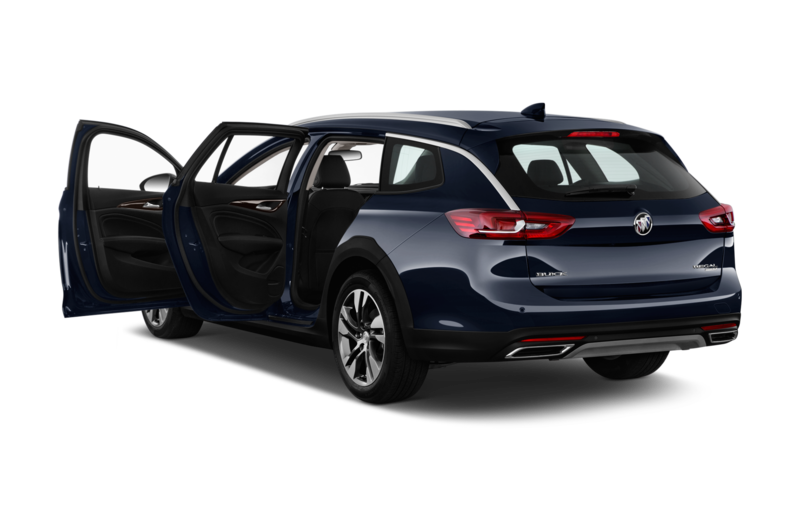 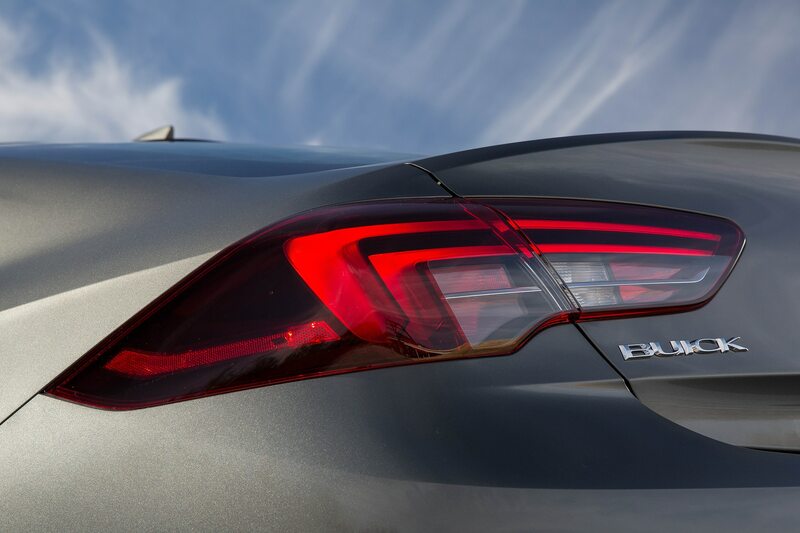 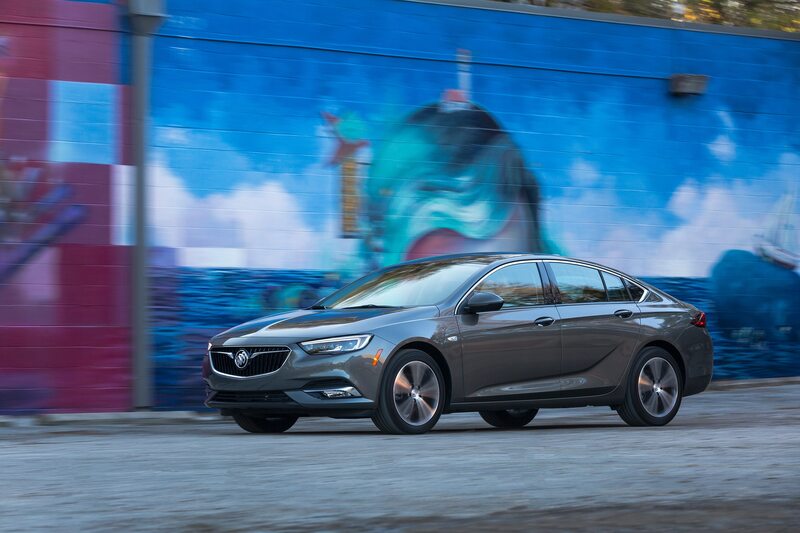 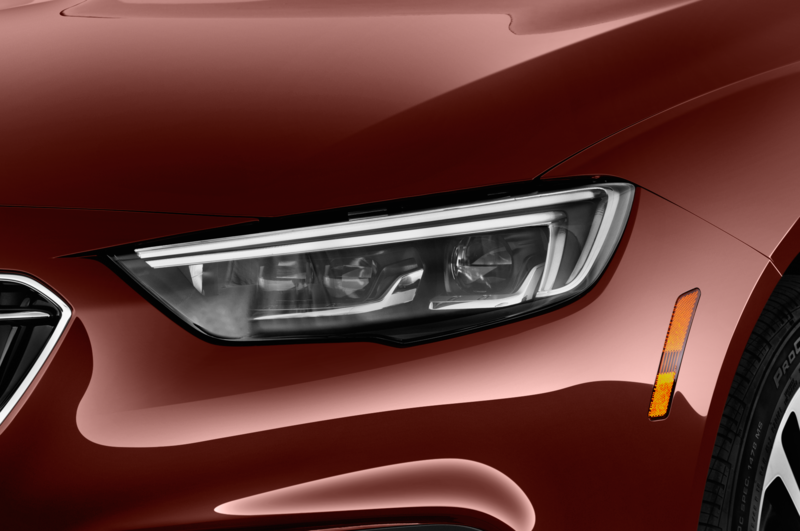 There will be no Buick Regal TourX Avenir, of course, and the plan to build the new Regal in Germany alongside the Opel and Vauxhall versions came long before GM sold its European brands to PSA Peugeot-Citroen. 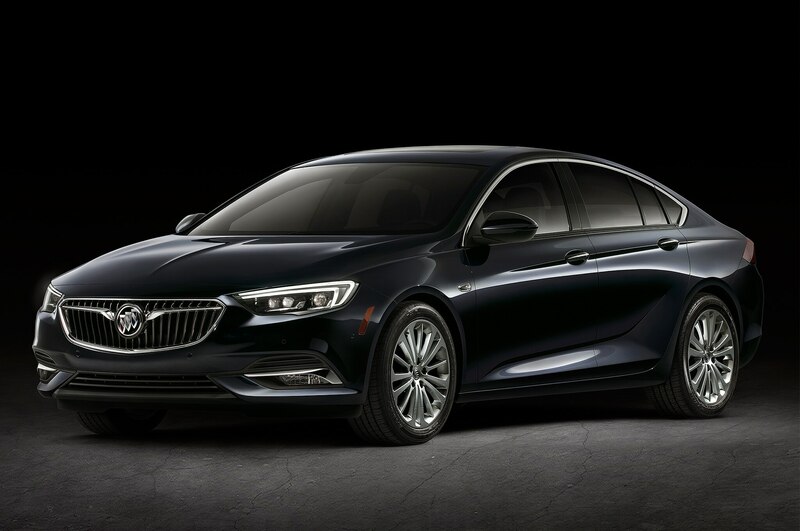 Buick says the contract with Peugeot-Citroen will provide as many Regals as demand requires, and based on early dealer orders, some 30 percent of them will be TourX models. 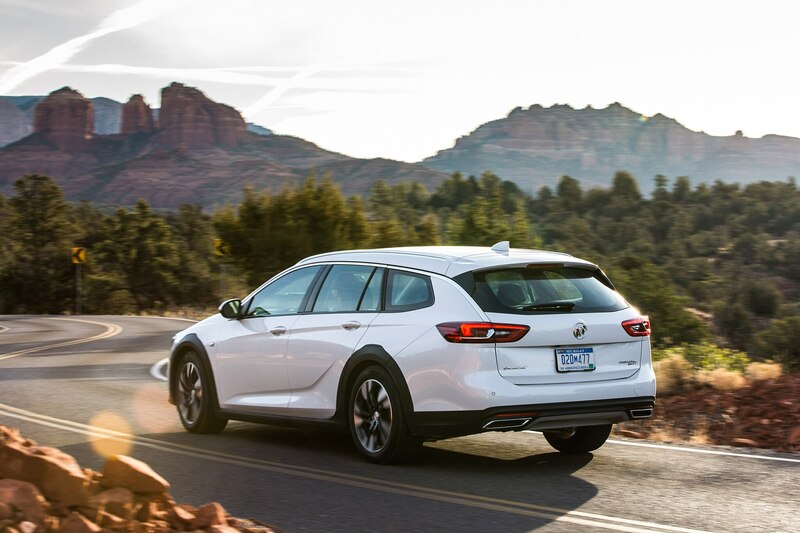 So what is this Buick that enthusiasts want to call a station wagon? 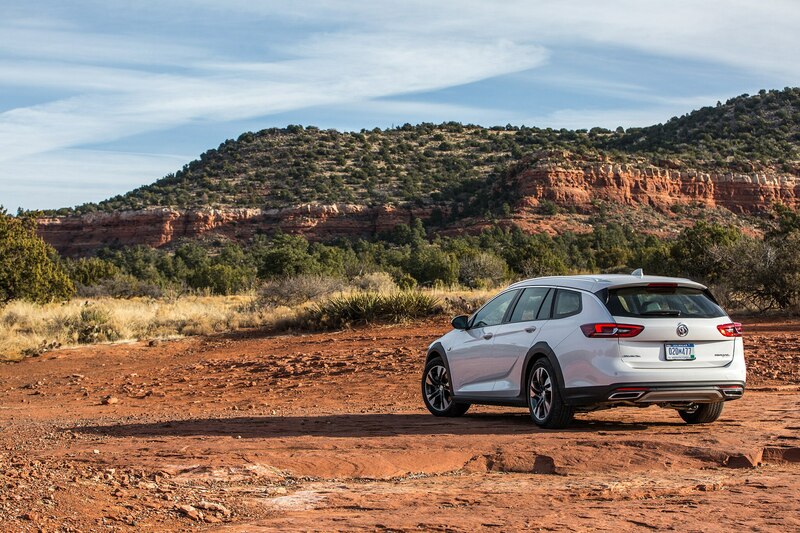 This car makes no attempt to pass itself off as a shooting brake-style sport sedan, though with its much lower center of gravity, enthusiasts should find it more interesting than, say, a BMW X5. 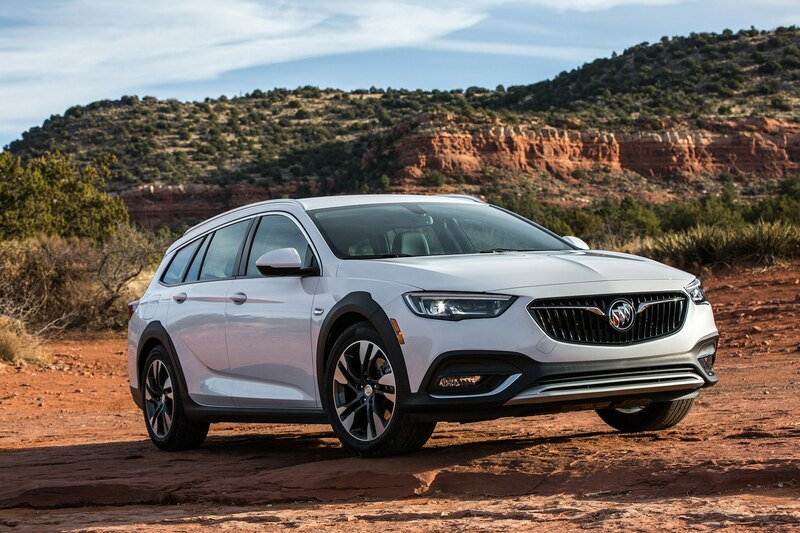 The ’18 Buick Regal TourX has much more in common with the comfort-and-style oriented Volvo V90 Cross Country, for about $25,000 less. 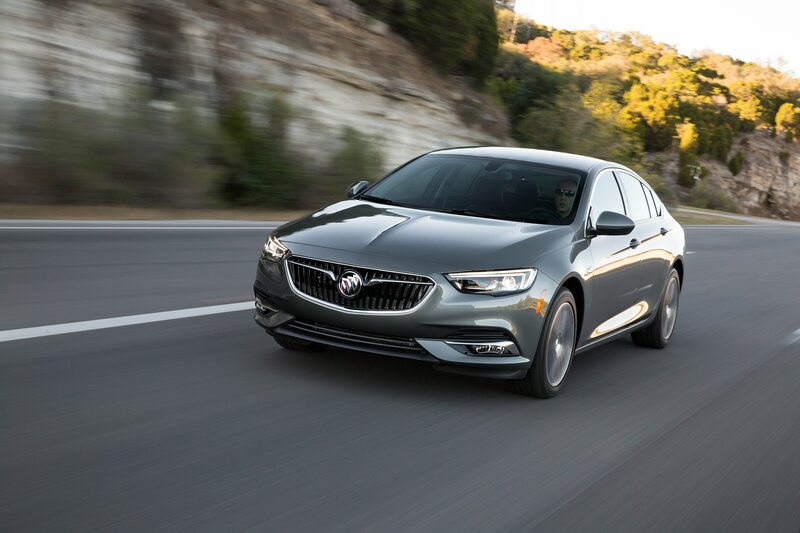 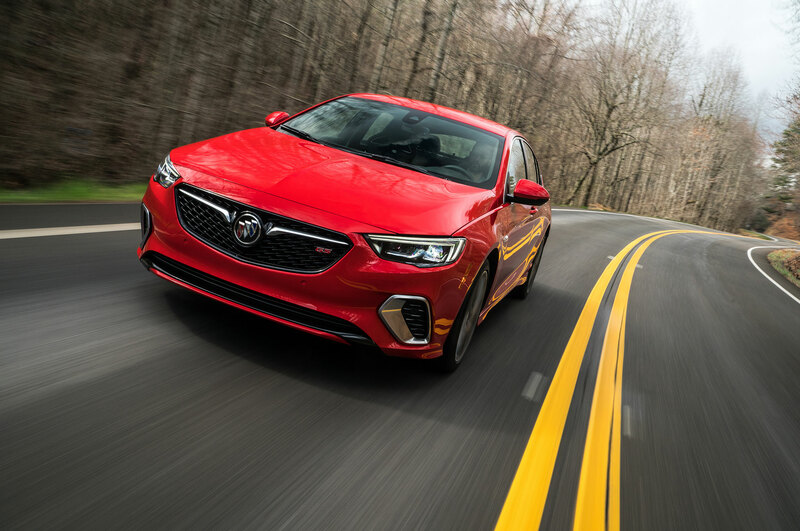 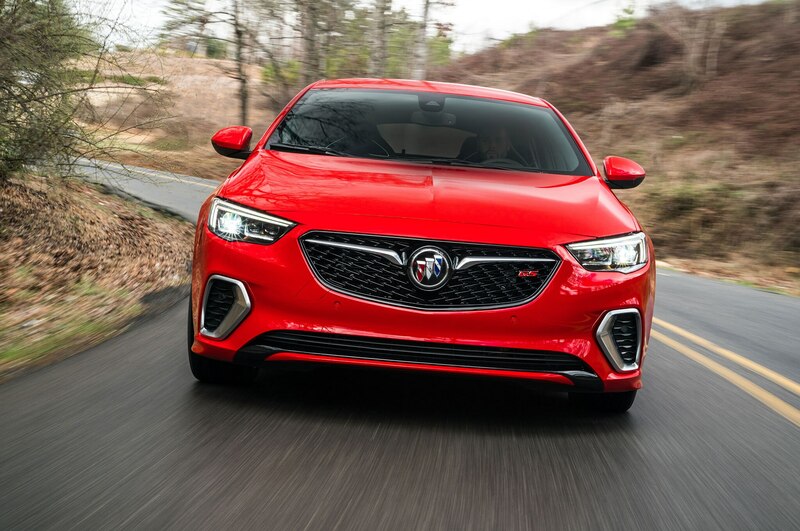 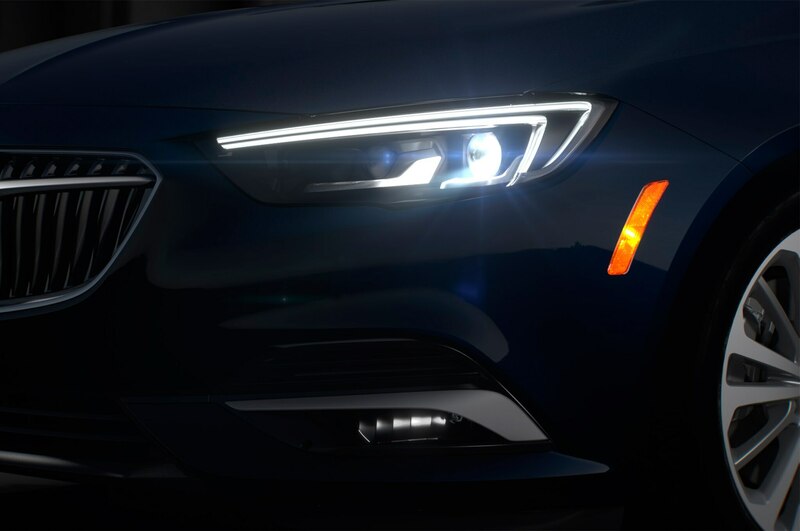 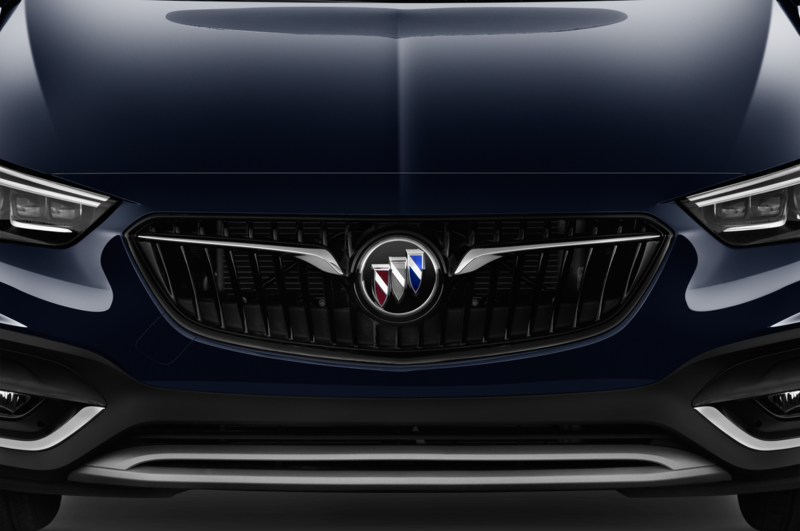 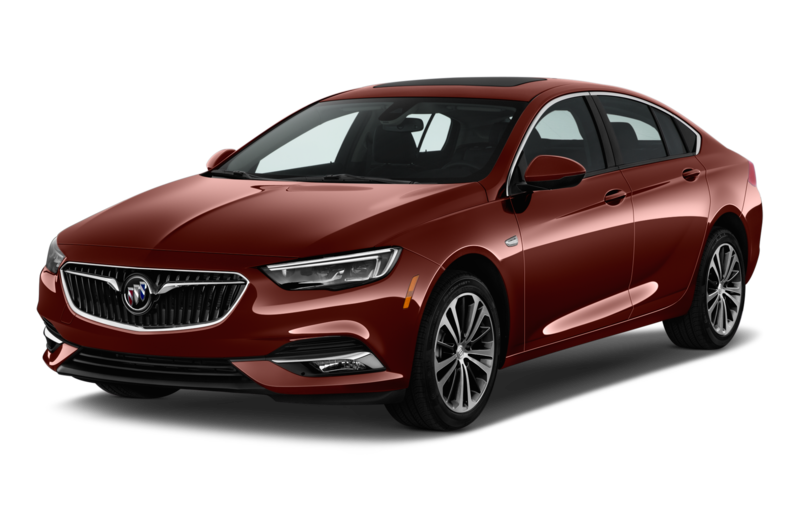 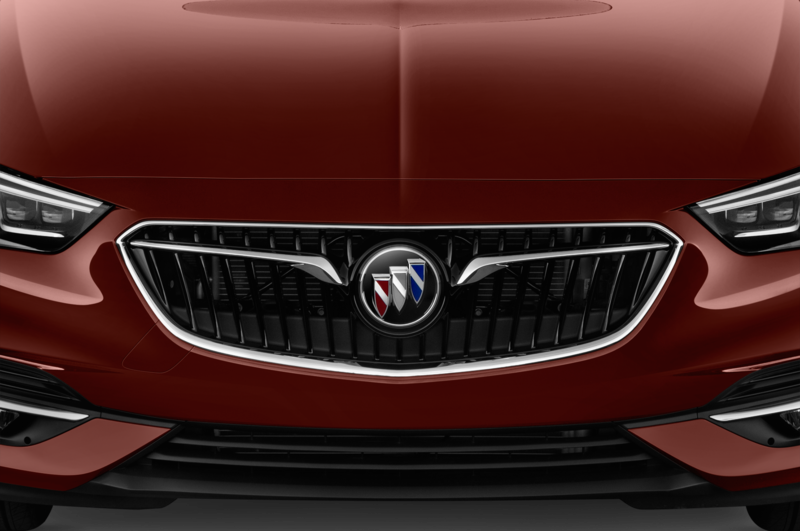 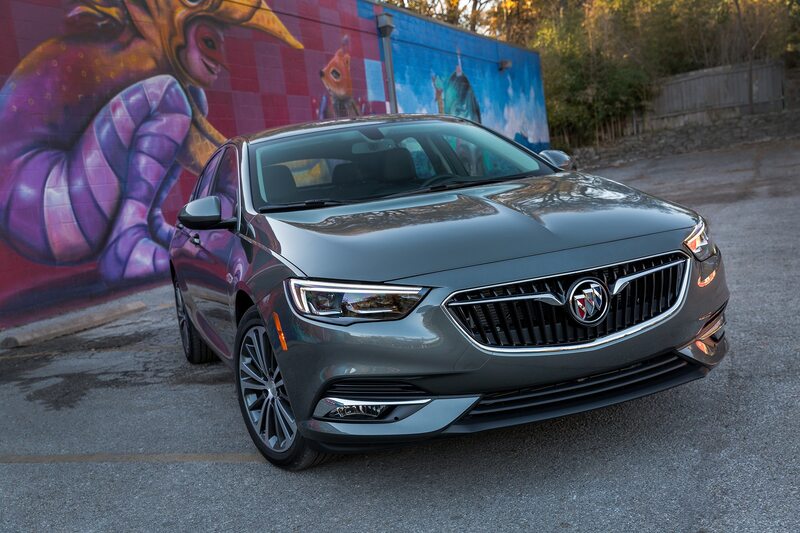 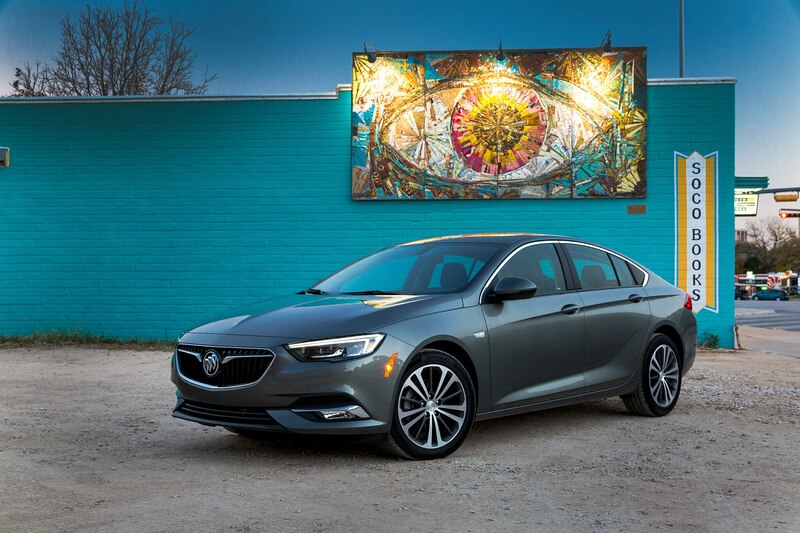 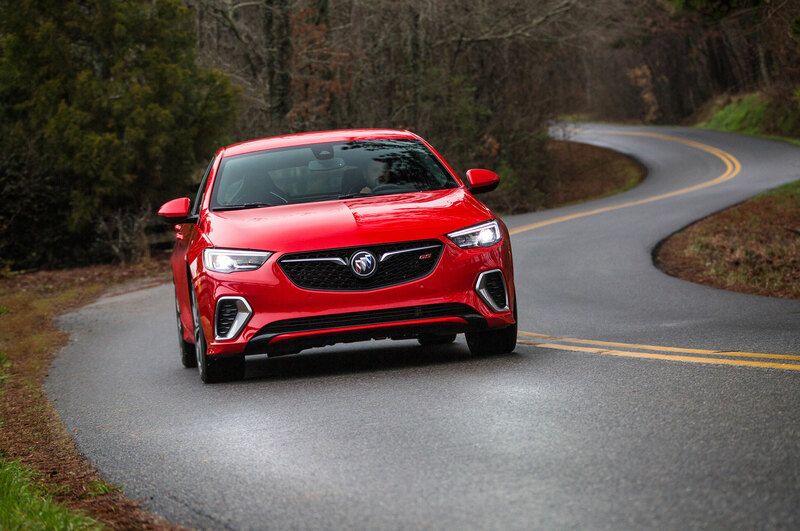 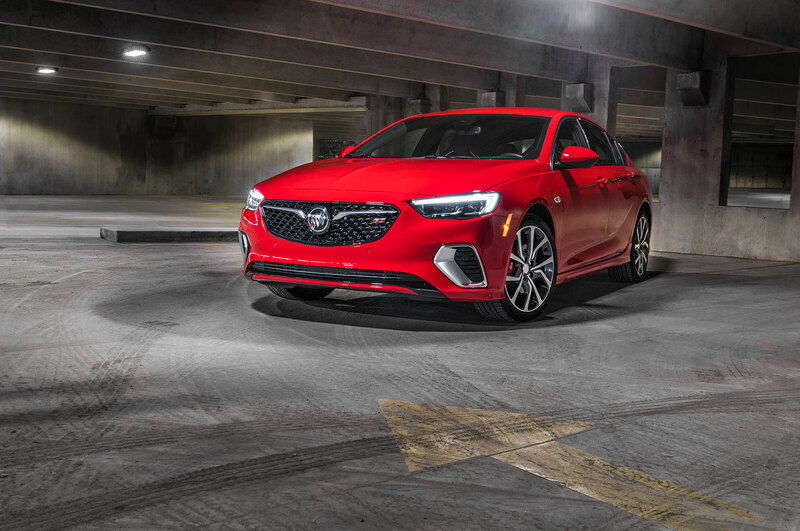 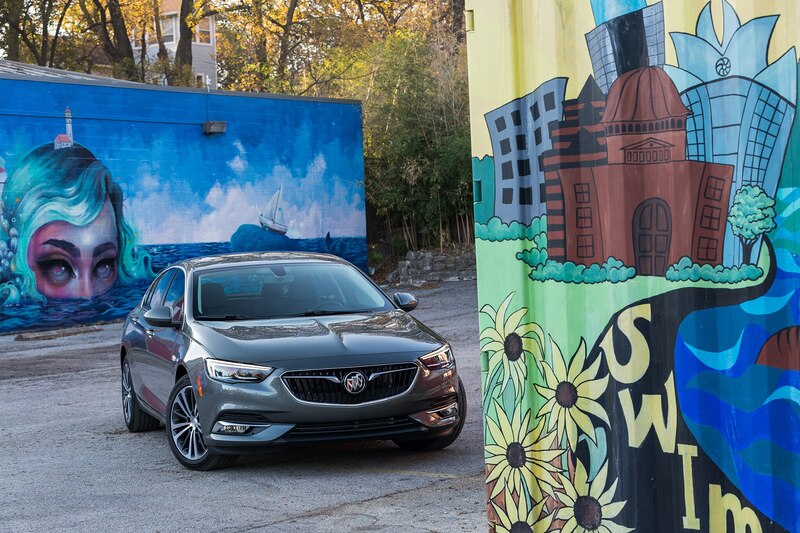 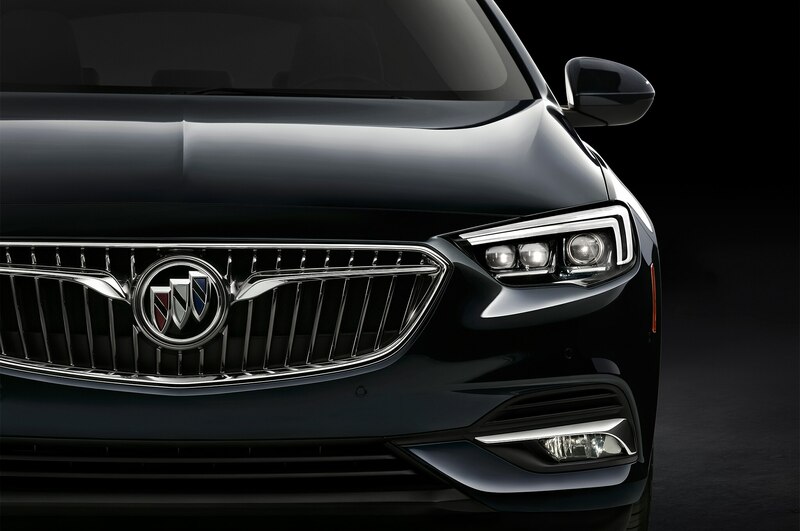 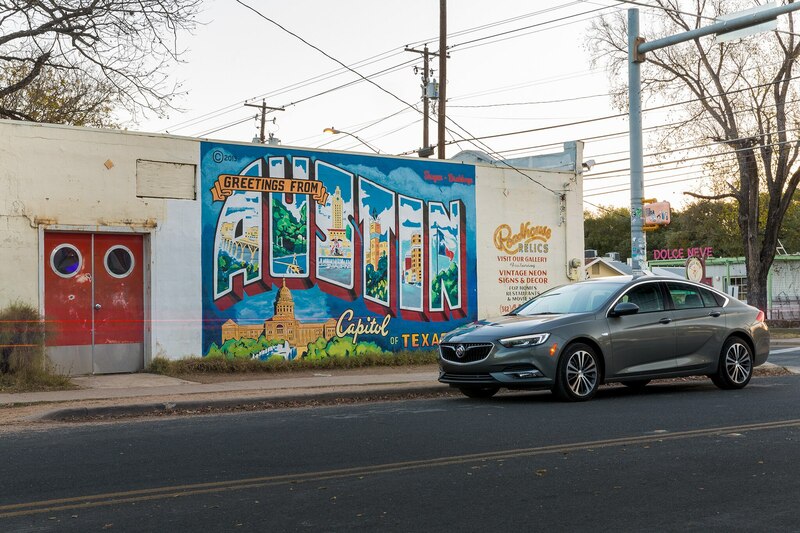 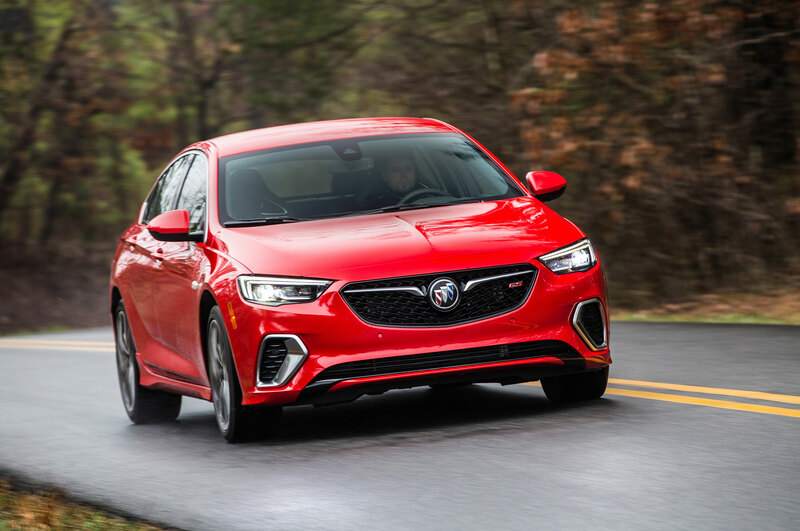 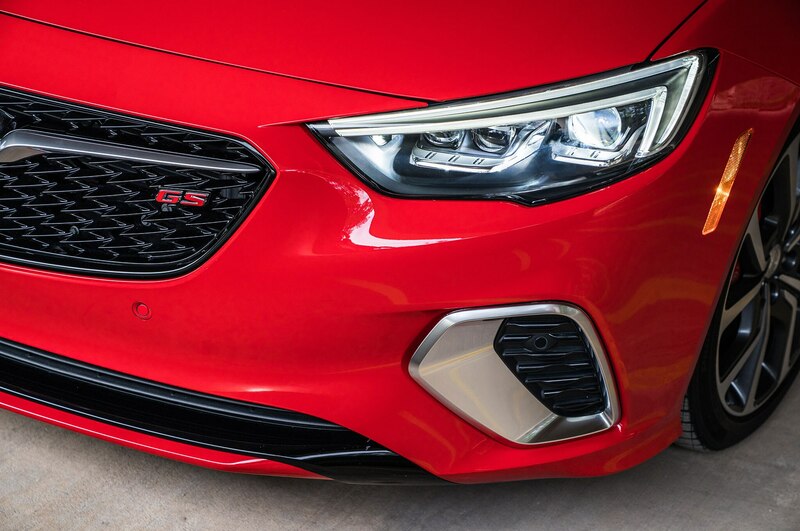 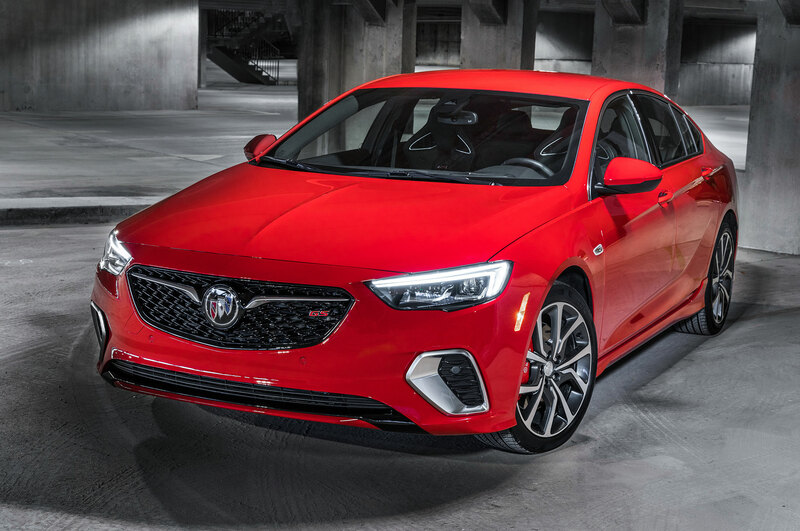 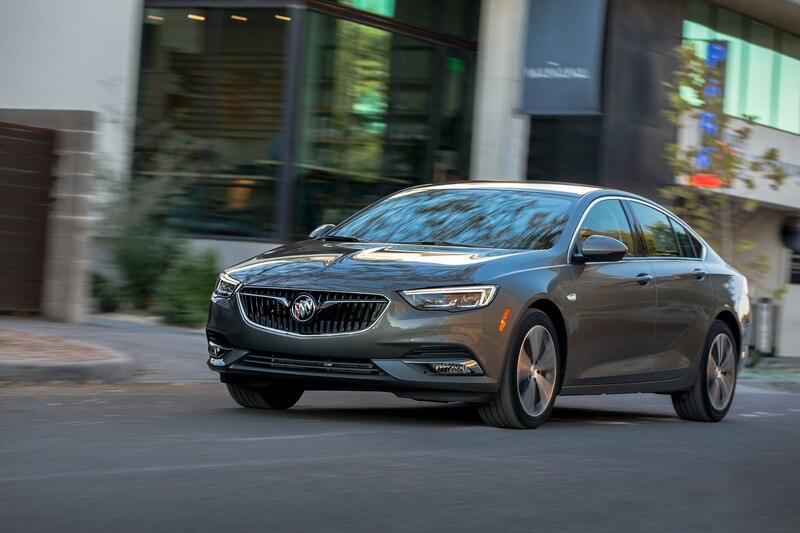 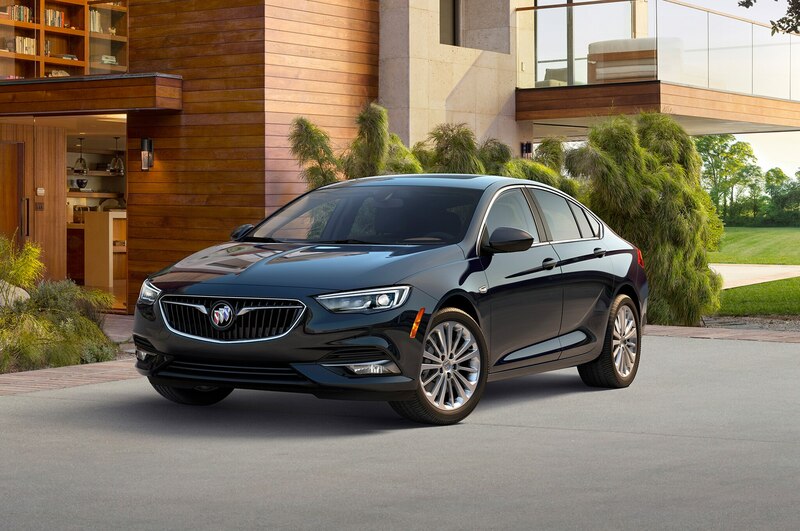 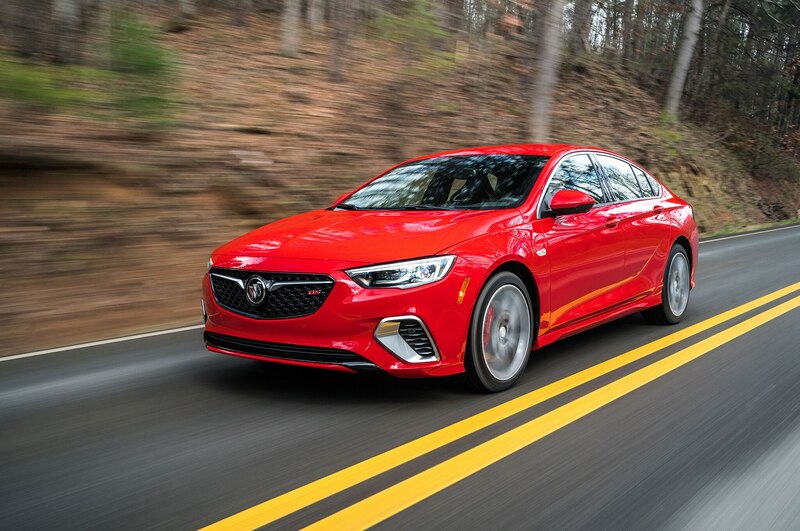 If it becomes a success, look for Buick to find a North American production spot after the end of GM’s three-year contract with Peugeot-Citroen. 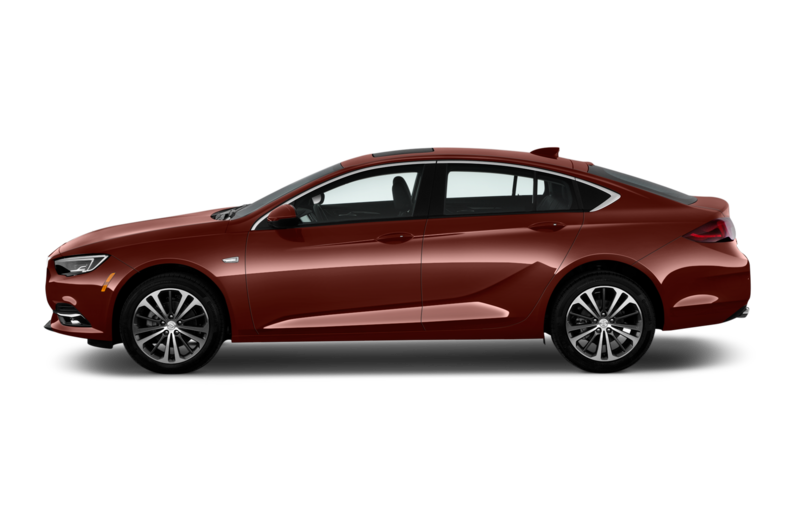 Or better yet, maybe they’ll replace it (here we go again) with an all-new TourX on the Alpha platform.